As I drove past the car park at Huisinis it was rather comical seeing all the campervans lined up with barely enough room for them to open their doors. It’s not exactly getting away from it all when you can hear your neighbour snore. We stopped off at Tarbert, the capital of the Isle of Harris, which to call a one horse town would be unfair to towns with one horse. It’s a dreary sort of place only enlivened by the fact that there is a tap outside the tourist information centre. I did however contribute to the local economy by handing over my credit card in the Harris Tweed shop. A birthday present for my wife procured with some relief with only a few days to spare. 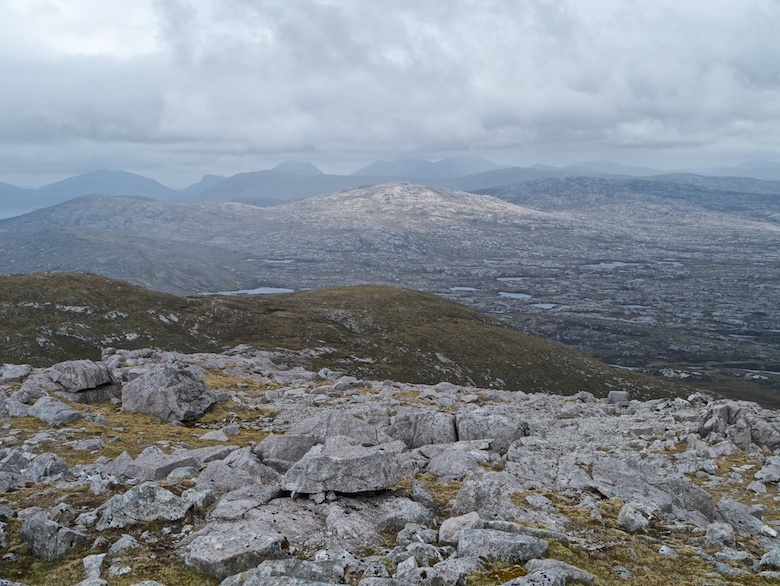 The plan for the day was to do a circuit of South Harris in the Bongo, visit a cafe and climb a hill. The Temple Cafe at Northton is worth a visit, a contrast to the bleakness of the island. Nice hippy type vibes, great views and some real food to set me up for the day. My wallet was considerably lighter when leaving though. 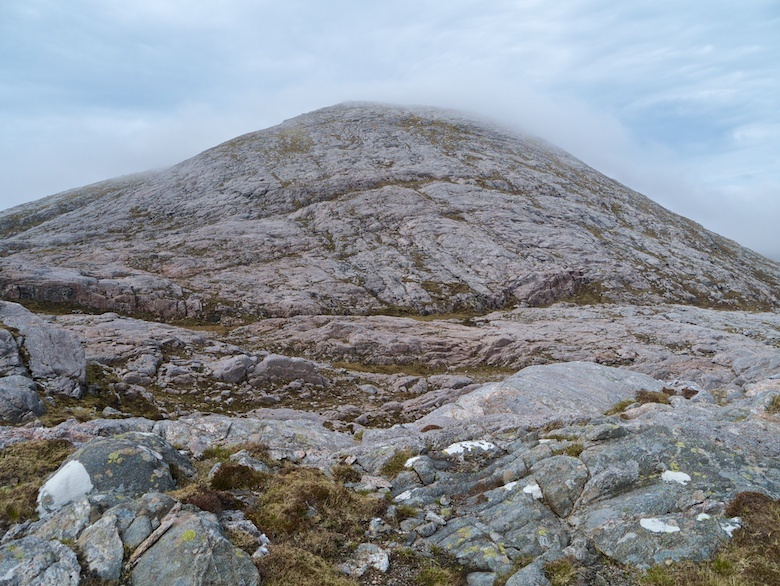 I had planned to climb the 368 metre Ceapabhal after lunch but from the cafe it looked like a long, dull and steep plod up to its summit. 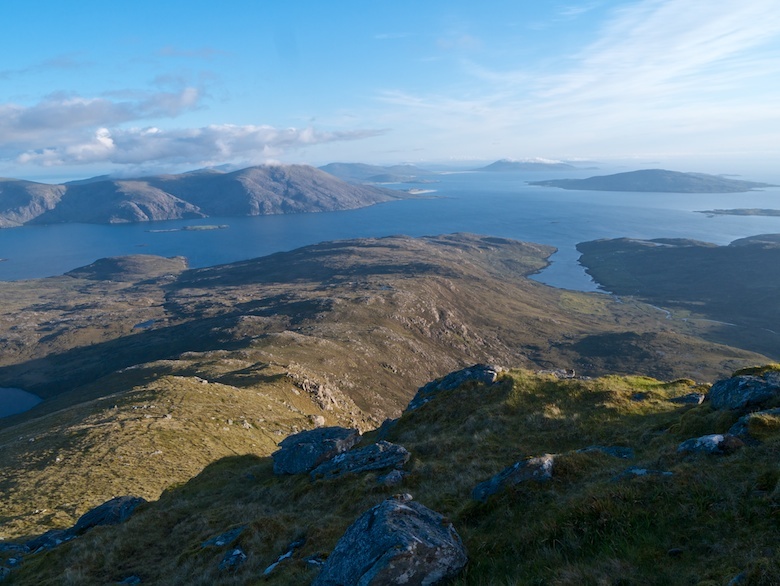 I’m sure that the views would be exceptional though, along with the walk around the surrounding coastline. 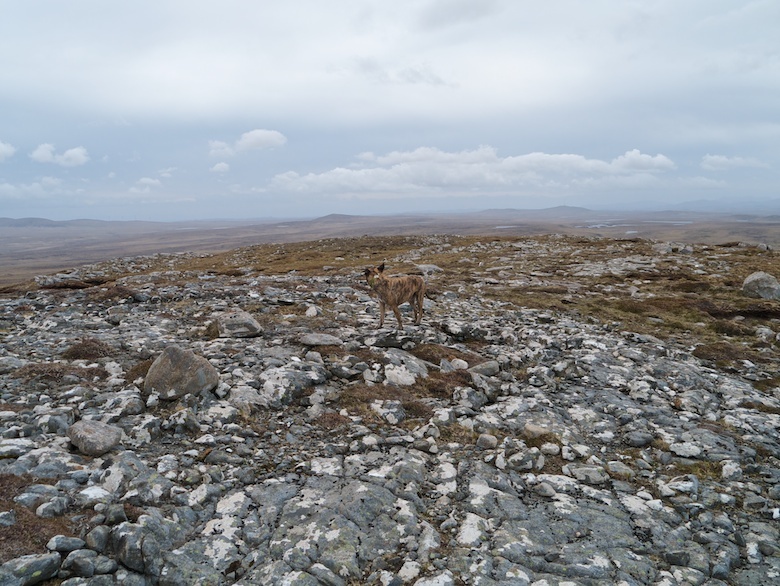 Instead we headed for a rocky beast just outside the village of Leverburgh. I just about managed to squeeze the Bongo off the narrow single track road a kilometre north of Rodel. 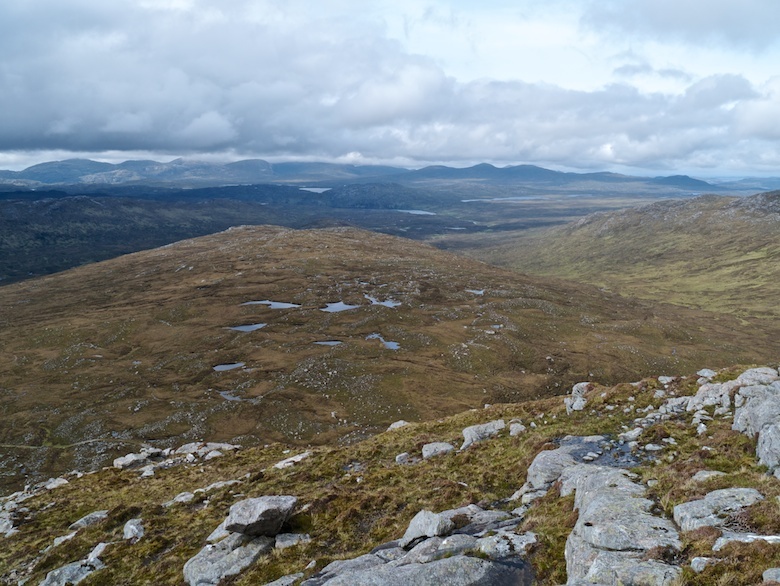 It was then just a case of bashing through the heather, bog and rocky outcrops to pick up the wide southern ridge. We then found ourselves in a totally surreal and barren lunar landscape, almost devoid of vegetation. 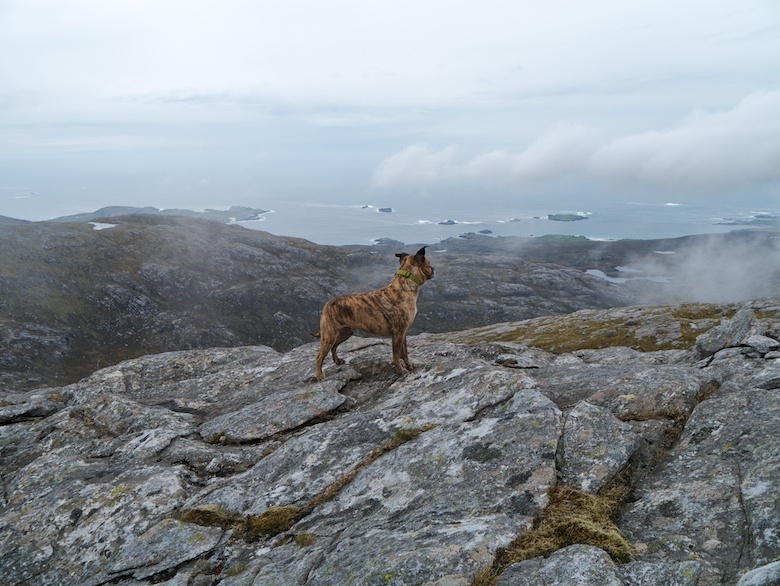 It really was an exceptional ascent, made all the better by the surrounding seascapes that were gradually being revealed. Being a relatively small hill the summit was reached in less than an hour, even with dawdling. 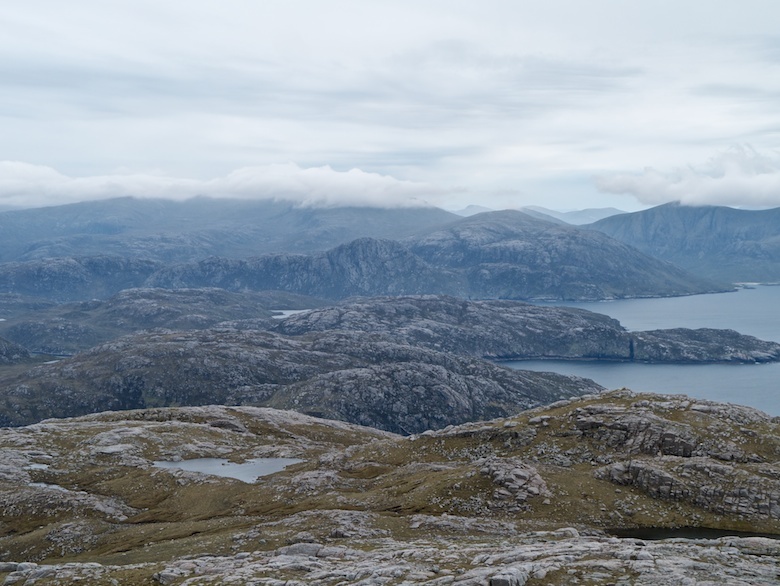 The view to the north took my breath away, a landscape of lochans, low hills and rock. Lots and lots of rock. I think that I should let some photos do the talking. 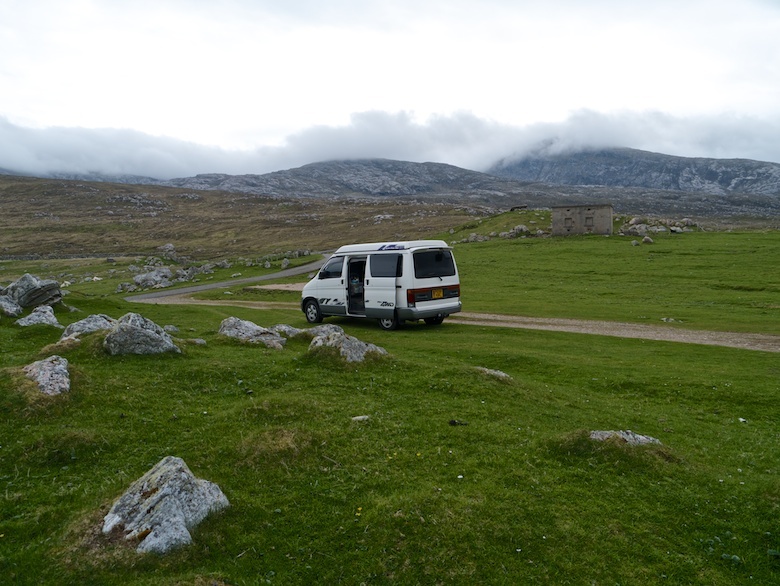 Safely back at the van we headed north on the narrow and twisting road along the east coast of Harris. I kept my eye out on suitable places to spend the night in the van but options were limited. The only good spot already being occupied by another retiree tour bus. 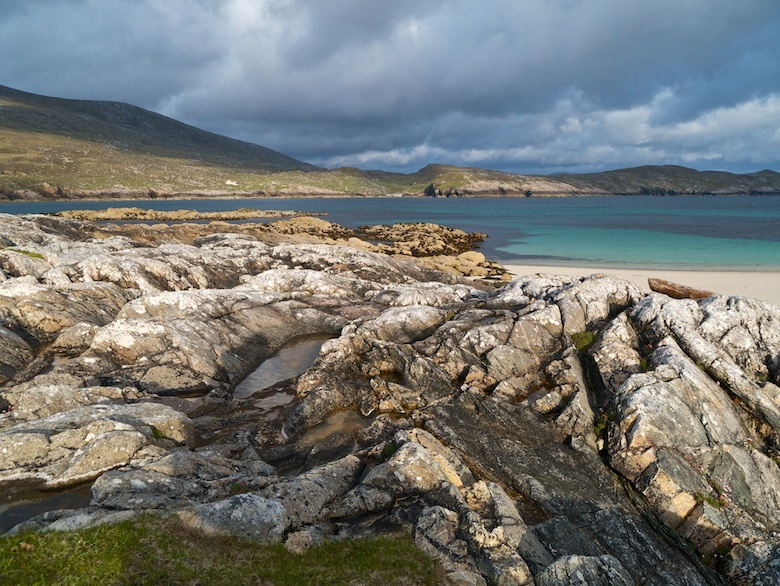 The interior of south Harris is somewhere to head as a backpacker to seek out some truly wild spots. However I’m not sure if there would be any suitable pitches that are not rock, water or bog. 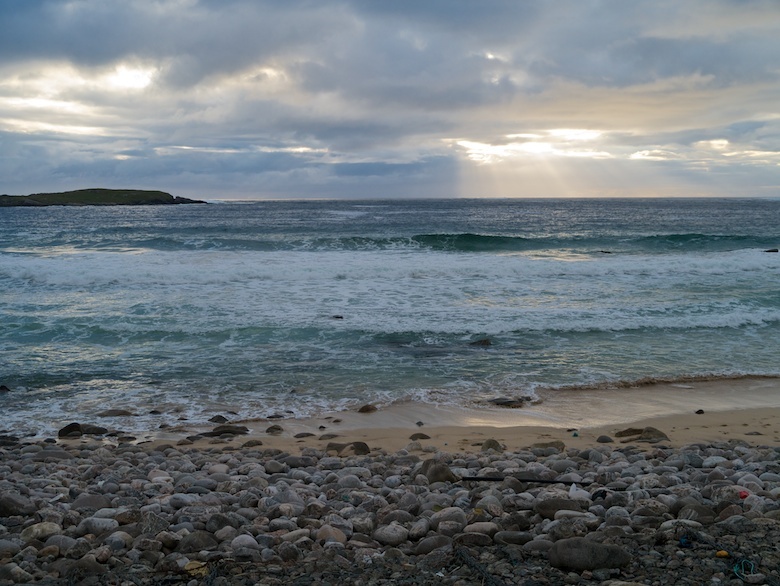 Late in the evening we ended back on North Harris at the mouth of Gleann Mhiabhaig, only a few miles short of Huisinis where we had started the day. 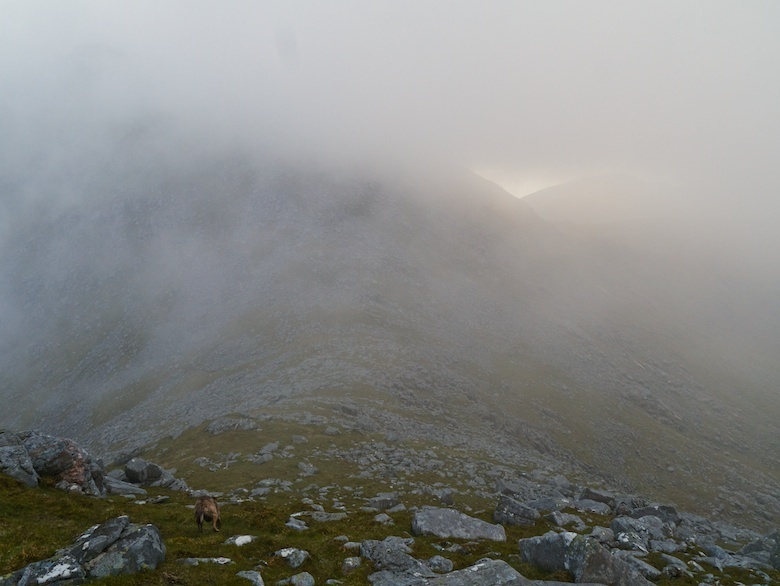 Once again the Bongo received another Hebridean battering that night, the hills that I planned to climb the following day hidden under a blanket of dark cloud. I woke to another world of murk so went back to sleep. The forecast was for slowly improving conditions with a bright sun symbol for early evening. We finally set off on a thirteen mile walk after midday, the surrounding hills yet to shake off their morning blanket of cloud. 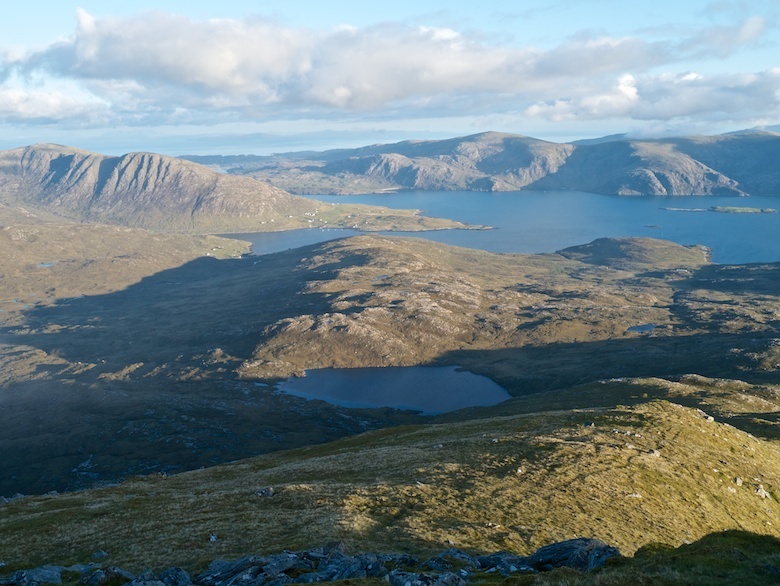 The day started off easily enough, following a landrover track north, deep into the wilds of the North Harris hills. We passed the eagle observatory and several people who had failed to spot anything due to the low cloud. I was to see six later that day. 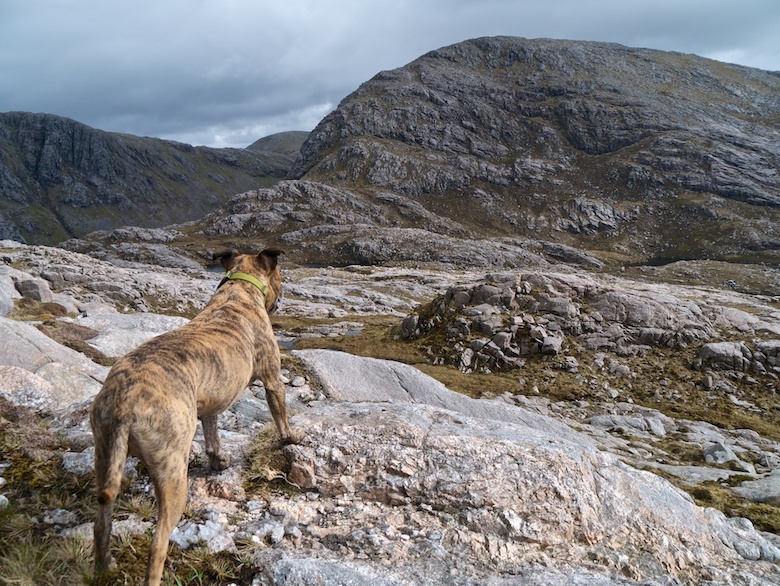 The track finished at a fishing hut at Loch Bhoisimid and we took to a well engineered stalking path. 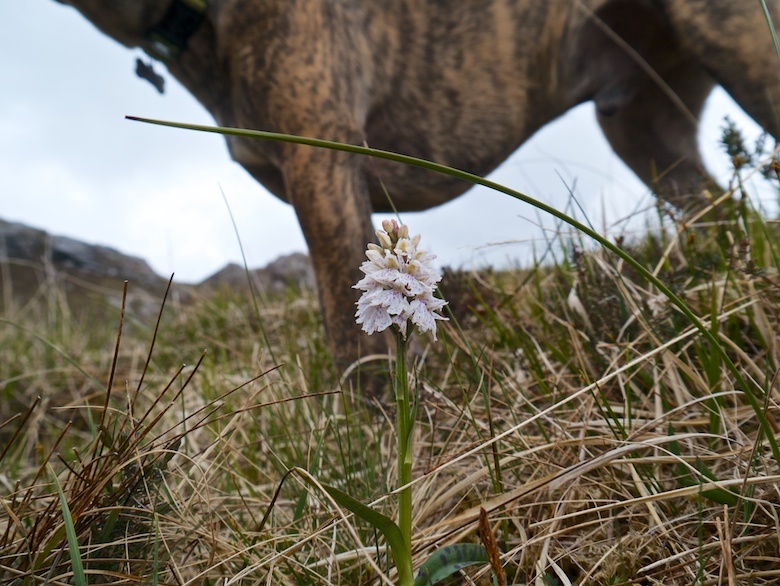 Crossing a stream and stopping to fill my water bottle I made an unpleasant discovery. My Pacerpoles were strapped to my pack as I had been walking Reuben on his lead up to that point. Somehow the bottom two sections of one had escaped since leaving the van. I was annoyed that I had not tightened them up properly, but to return perhaps all the way back to the Bongo would have put an end to a day in the hills. I decided to continue. 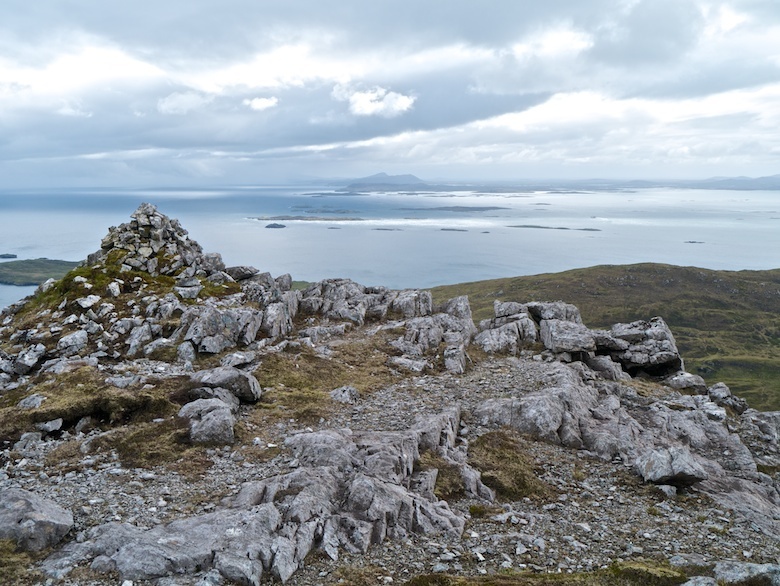 The security of the stalkers path was soon left to climb very steep and rough ground up the north-west ridge of Stuabhal and into the ever shifting clouds. The base would rise and fall like the sea, giving either zero visibility or uplifting views. 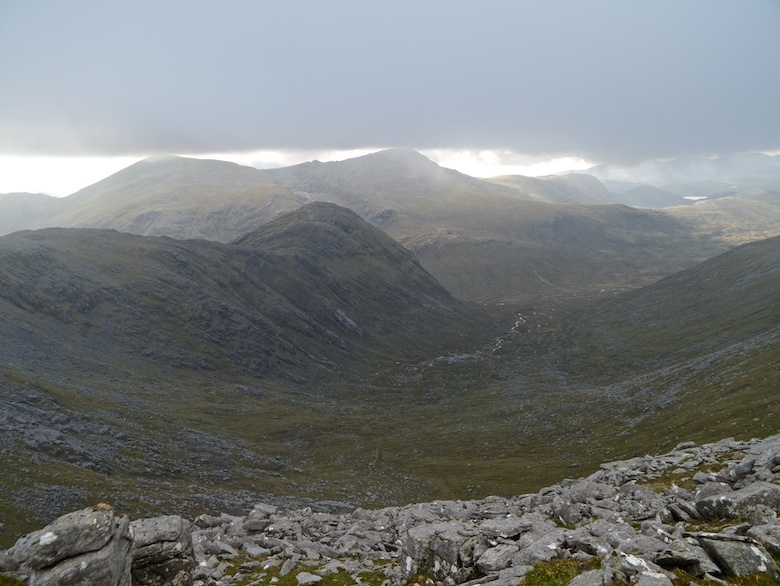 The scenery as we curved round and over Teileasbhal and Uisgneabhal Mor was outstanding, the swirling cloud and shafts of sunshine adding to the atmosphere. 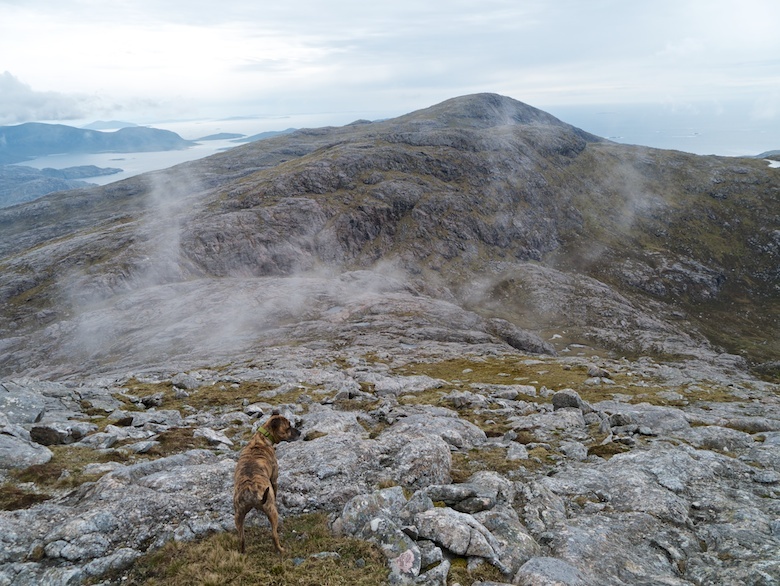 There was a sublime moment on the summit of Uisgneabhal Mor when a golden eagle loomed out of the mist, flying a few metres overhead, silently being swallowed by the cloud. I was grinning from ear to ear. It was on the final long descent of the day when something truly special happened. The cloud started to break up properly, patches of blue sky appearing before being engulfed again. 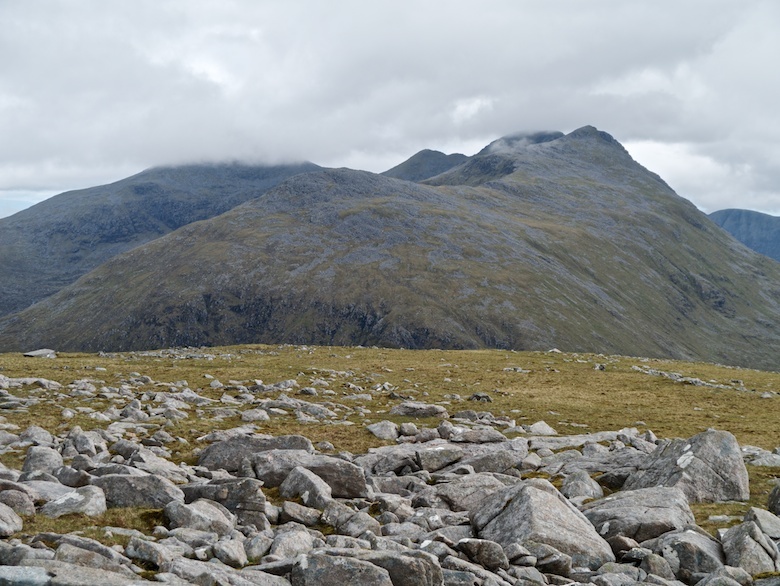 Often it would be clear on one side of the ridge whilst the glen on the other would be full of cloud. Several times I saw a perfect Brocken spectre, a halo of light with rainbow colours and my huge shadow in the middle. It would last a couple of seconds before the clouds were snatched away, returning for the briefest of moments. Sadly I was not quick enough with the camera. Finally the cloud dissipated leaving clear blue skies. 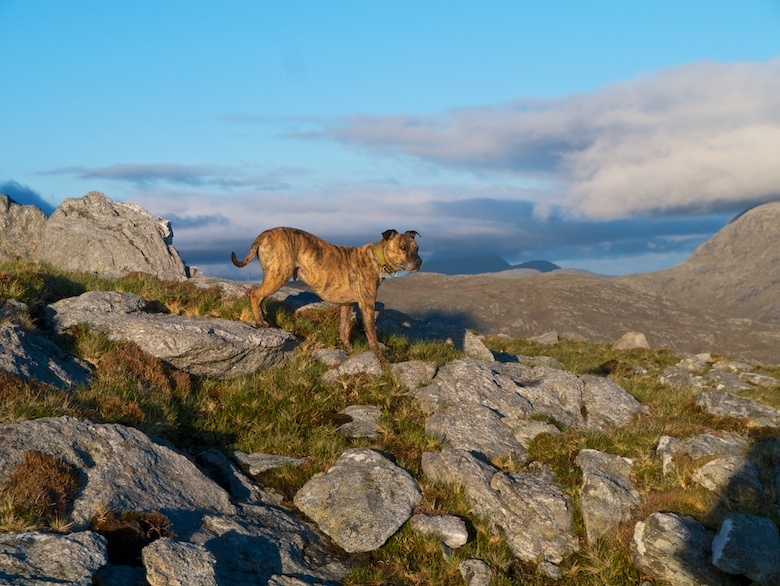 I lingered and took my time descending back to the van, the weather had finally played ball for a last day on the hills. It was a very tired man and dog that got back to the Bongo at past 10.00pm. Reuben was a broken dog the following morning, he would have preferred to stay in his bed rather than getting up for the loo and food. It was probably a good thing that we were getting the ferry back to Skye and starting the drive home that afternoon. 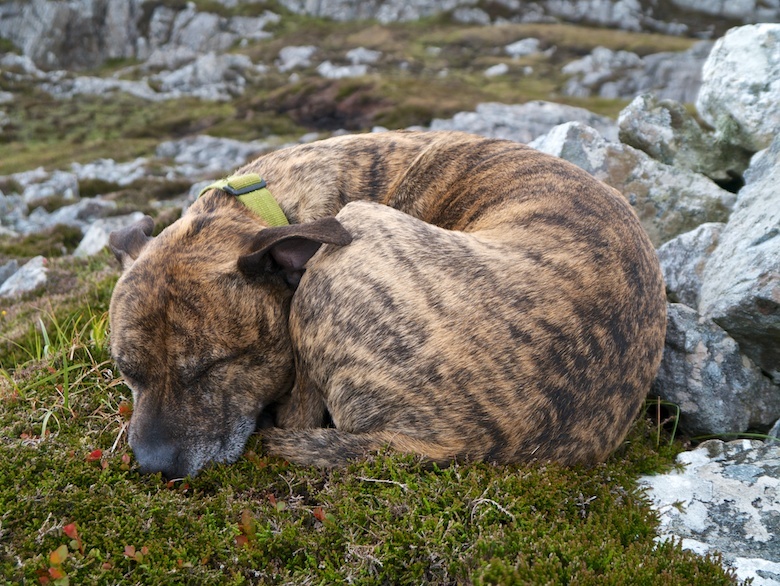 I don’t think he would have been very happy being taken up another mountain. Typically the day started warm and sunny, even the cold wind of the past week had dropped. The weather always seems to turn for the better just before a long drive home from Scotland. 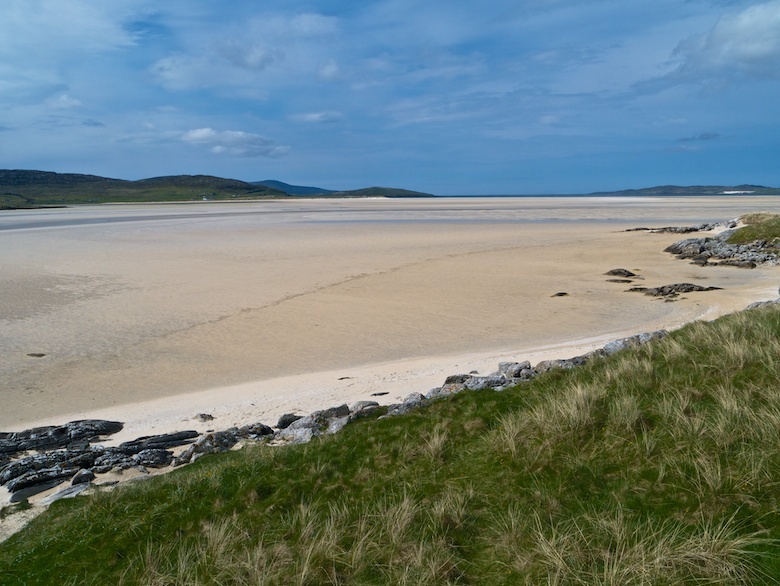 I thought that with a few hours to spare before the ferry it would be nice to visit Luskentyre, often listed in the world’s top ten beaches. Although I did not go right to the end of the road where the beach is meant to be at its best, I found a spectacular spot to hang out for a couple of hours. Once presented with all that empty sand Reuben forgot he was tired and raced around as fast as he could. 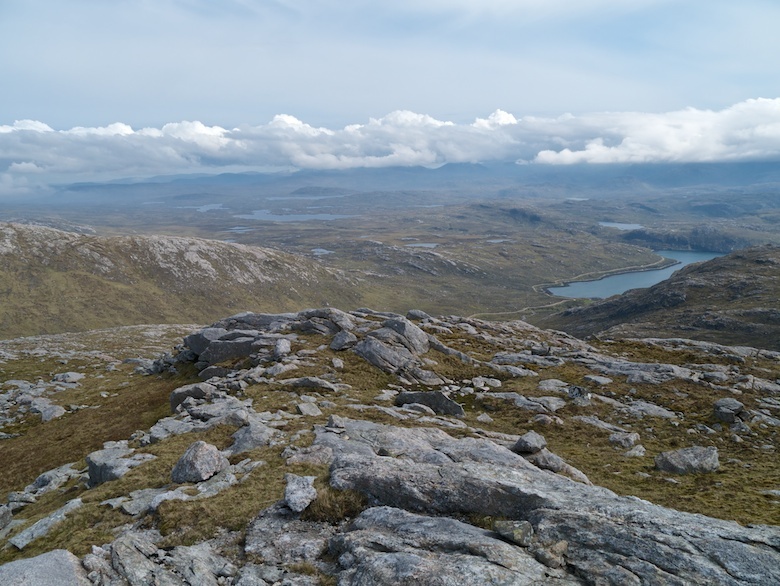 I will be back to the Outer Hebrides sooner rather than later. When I stuck my head out of the van door the cyclist, motorcyclists and campervan had gone. Peace and solitude had been restored to my wild camp spot. 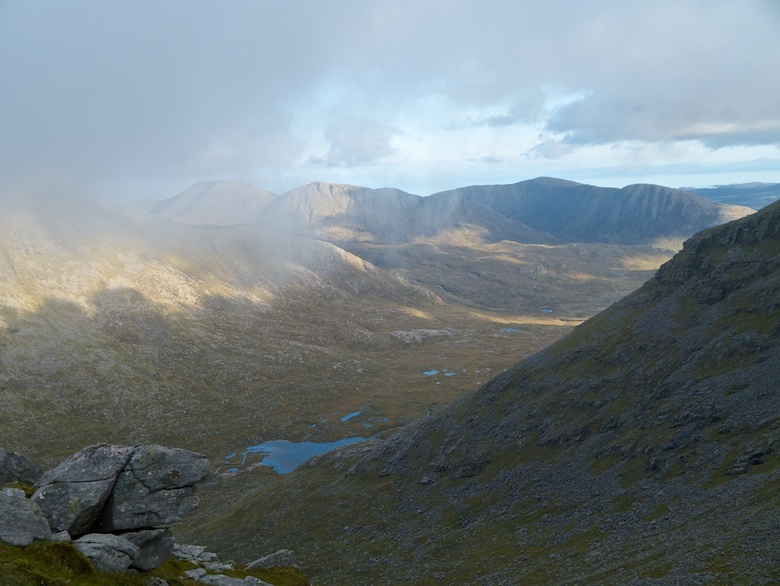 I was disappointed to see that low cloud hung over the peaks I had planned to climb, the day when it was actually meant to be sunny had not materialised. Time for a second breakfast before slinging my pack over my shoulder and setting off with Reuben. The names of the hills that I was climbing do not exactly slip off the tongue. The mass of contours on the map are equally indecipherable. Noticing cattle and fencing on the nearby small hill of Taireabhal we walked along the road for a bit before launching directly up rough slopes. 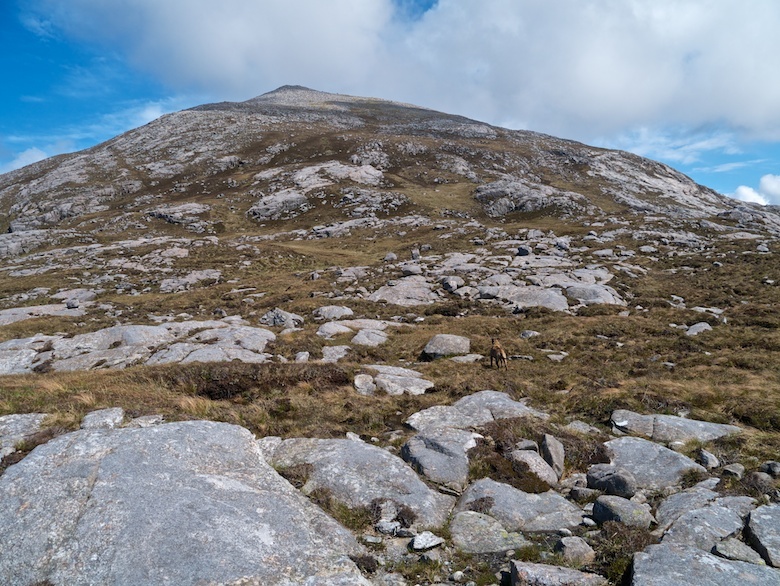 The aim was to gain the wide western ridge of Laibheal a Tuath, this would then give a straightforward ascent to the summit. The going was indeed easy until we were swallowed by the clouds. It was then that one boulder strewn bit of hillside began to look remarkably like the next. 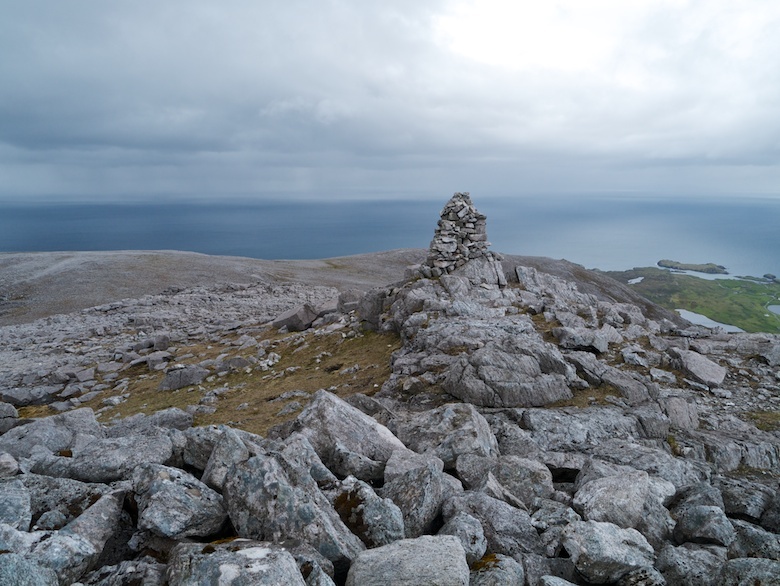 I’m not ashamed to say that I pulled out my Satmap GPS at the summit cairn just to double check that it was actually the summit. Thankfully it was. 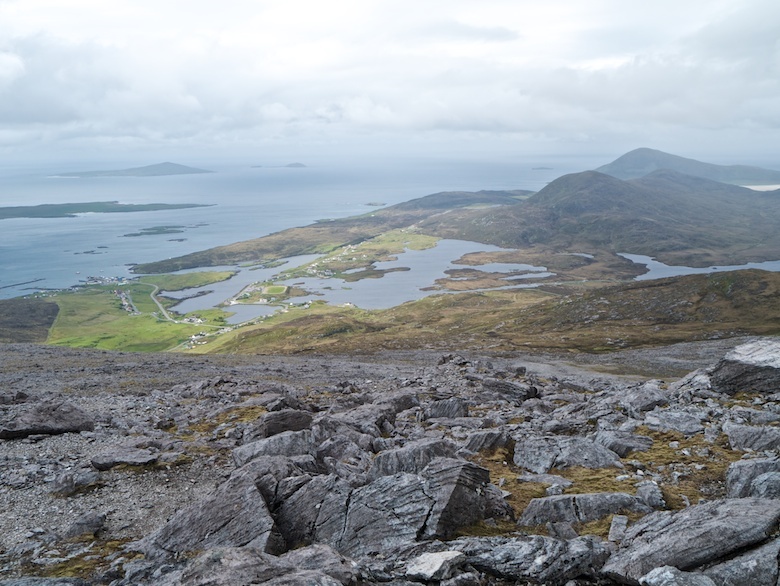 It was a case of counting the lochans to the minor summit of Laibheal a Deas. Distances and slopes being distorted in the mist. Suddenly patches of blue appeared overhead, sun lightening the swirling mist. The clouds were torn apart teasing me with a view for a few seconds before enveloping us again. They finally dissolved leaving a few wispy tendrils above and below, revealing a spectacular landscape. 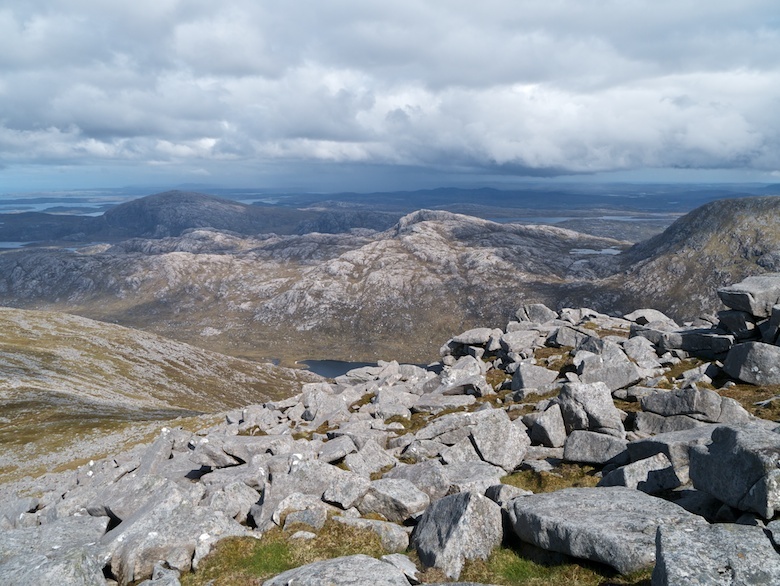 It was a land of rock and sparse vegetation, slow progress when picking your way through boulders and small crags. I misjudged one step and turned my ankle, the pain making me gasp. I had horrible thoughts about how I would get down with a broken ankle. Luckily this was not the case, although it was painful to walk on for a few days and still twinges now. 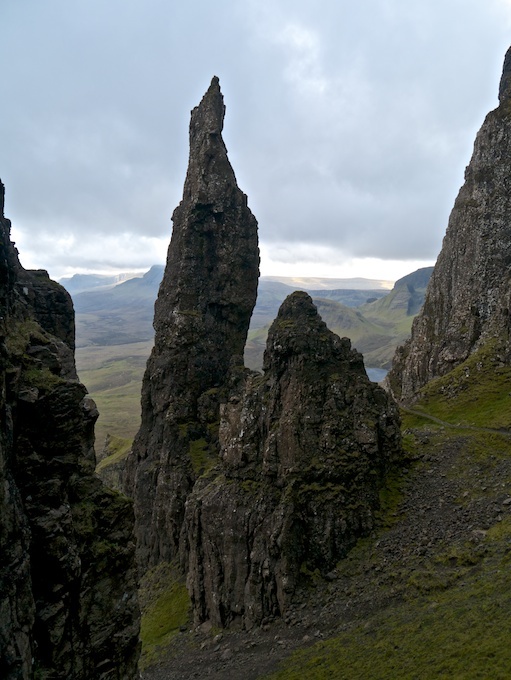 These are amongst the most spectacular hills I have walked and remarkably undiscovered. They deserve to be teeming with folk but I’m glad that they are not. 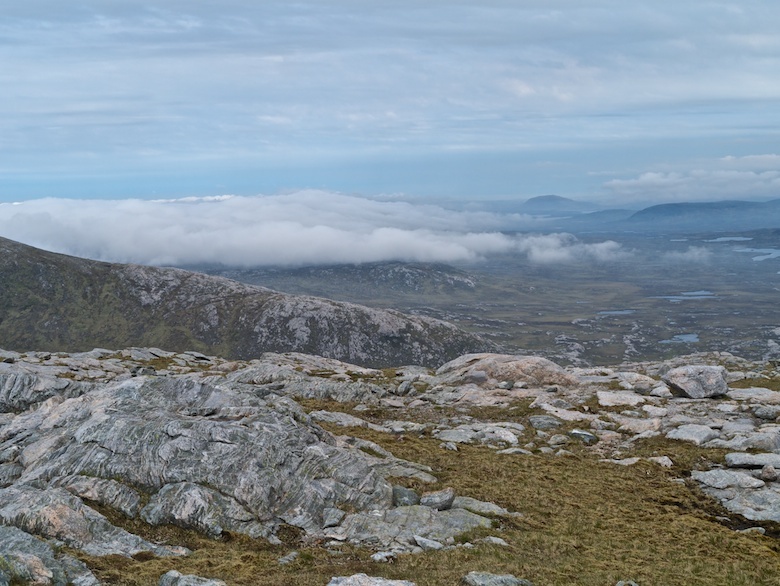 As we reached Griomabhal, the final summit of the day, I noticed that low cloud was creeping along the coast to the north west. Banks of cloud were also beginning to engulf some of the lower hills in the wild hinterland directly to the north. It looked like there could have been the possibility of an impressive inversion later that evening. 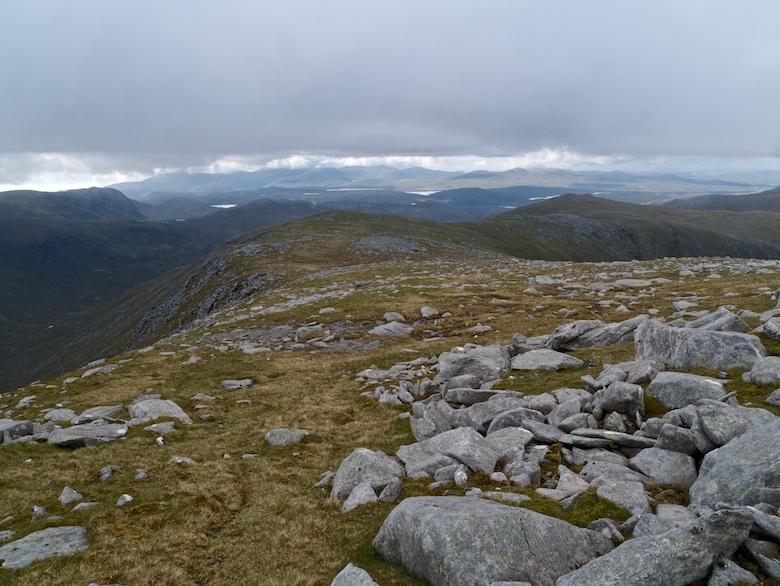 However with a grumbling stomach and the real possibility of just being engulfed in cloud we made our way slowly down the rocky west ridge and back to the Bongo. 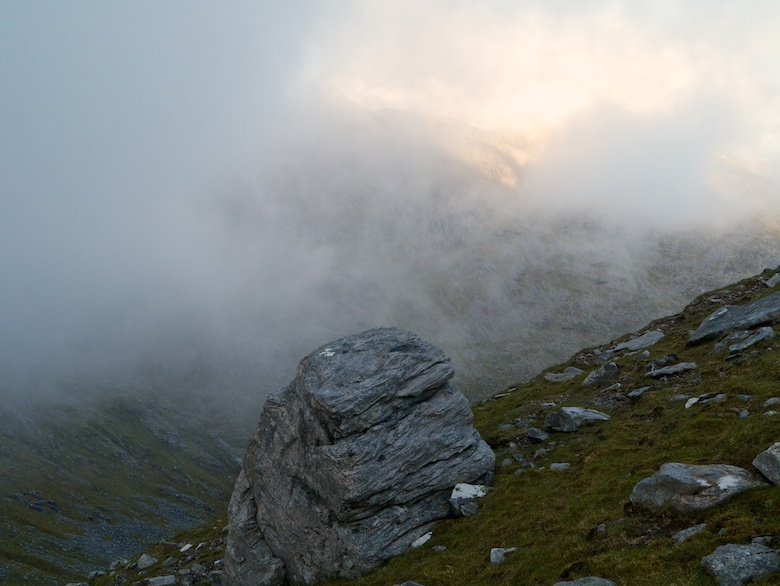 Later that evening I realised that I had made a good call when cloud engulfed the summits and slowly crept its way down to just above sea level. The gloom was atmospheric and I was lucky to have such a wild and beautiful place all to myself that night. The following morning the cloud was resolutely hanging low in the sky, barely above the roof of the van. Ruling out exploring the hills we returned to the great expanse of beach at Traigh Uige where Reuben indulged in chasing a ball and killing seaweed. I treated myself to a hot shower, the best pound I spent all week. 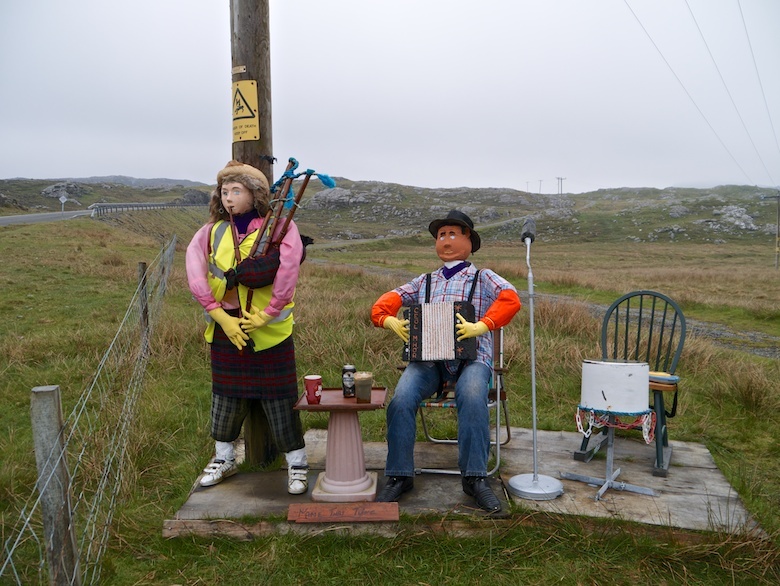 There is a community shop that sells fuel at the nearby village of Timsgearraidh. It is surprisingly well stocked and puts my local Co-op to shame. Even the diesel was only a couple of pence more expensive than on the mainland. What I enjoyed the most however was the dourness of the woman behind the till. I don’t think she could have been anymore unfriendly. It was like being in a surreal comedy sketch as she scanned each item with an incredible slowness. I felt like I had told an inappropriate joke about a dead relative. I was tempted to ask if they sold tofu and the Guardian but thought better of it. Driving back along the lengthy cul-de-sac road I spotted what I thought was someone tied to a telegraph pole. Thankfully this was not the case, instead a rather quirky scene which invited you to ‘join the band’, if the weather had been kinder I would have spent time encouraging Reuben to do so. One of the areas which I was most keen to visit was the peninsular called Pairc. 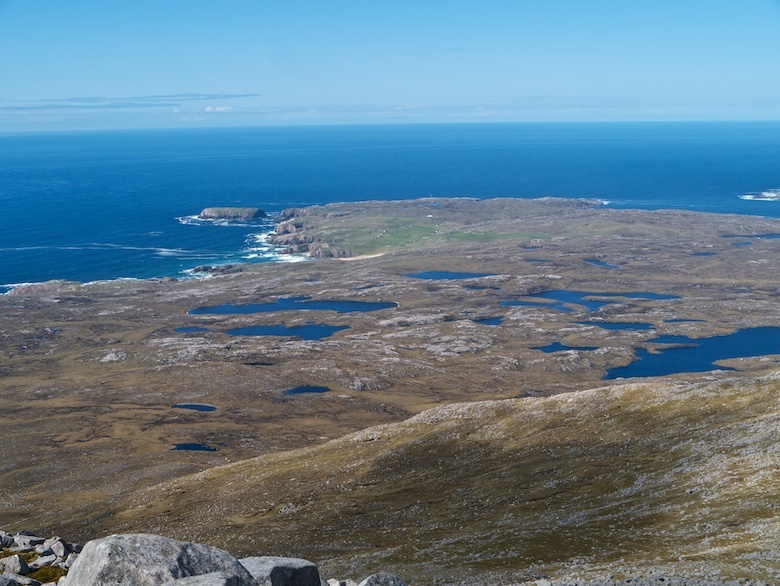 This is the wildest and remotest part of Lewis, appearing almost as an island on the map. 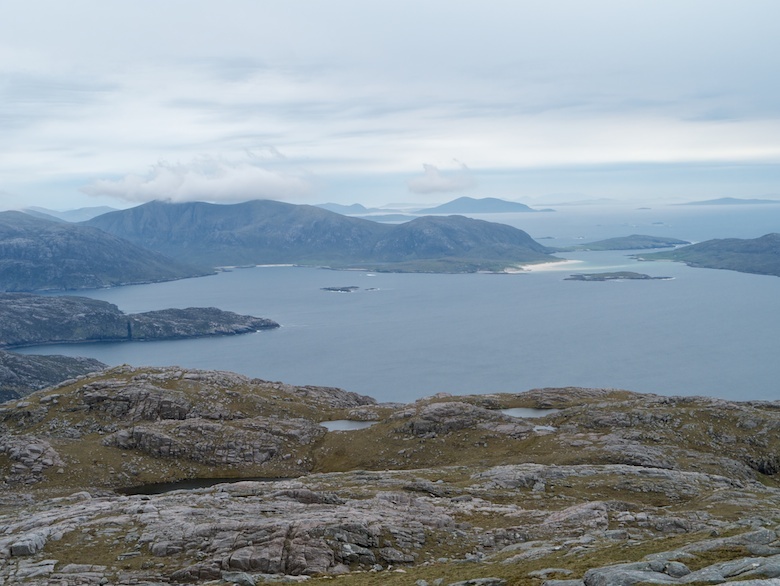 There are some very remote hills and coastline, really only accessible by the backpacker or boat. It has one of the highest densities of eagles in Europe. 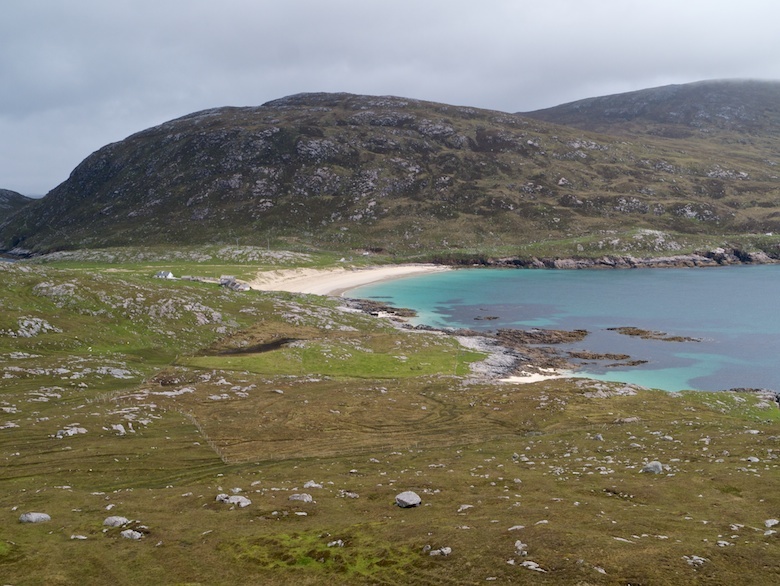 Sadly this little known area has come into the spotlight due to the 33 turbine Muaitheabhal wind farm and the 6 turbine extension that have been consented for the area. Although they have yet to be built. There is now another 20 plus turbine extension to the south being planned. 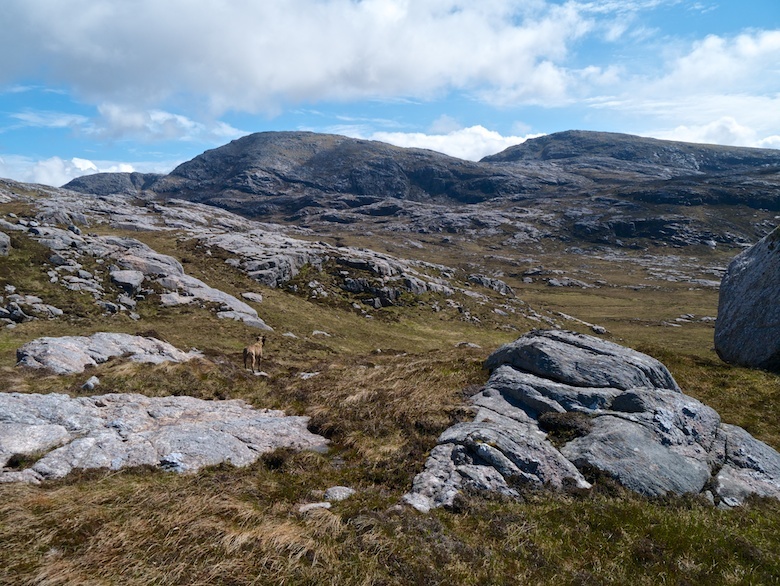 All in a vast swathe of wild land. I wanted to have a look at the area before it is lost. The single track road there is in very poor condition with few passing places. I was constantly hoping that I did not meet anyone coming the other way. 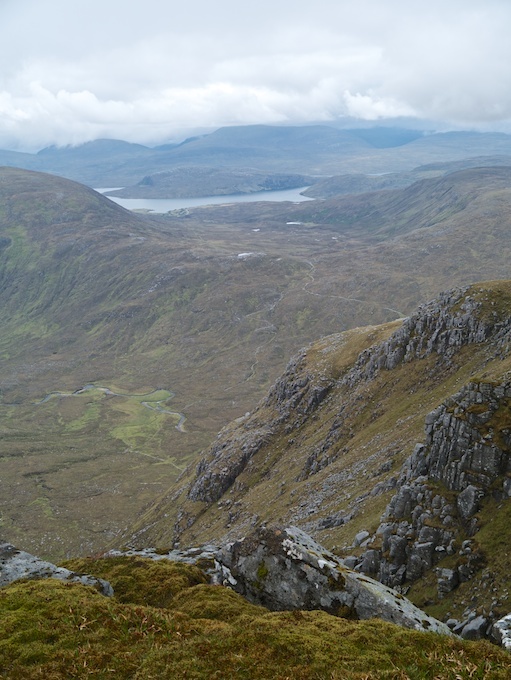 The plan was to climb the 327 metre high Feiriosbhal where most of the turbines will be located. Sadly the weather was not playing ball. 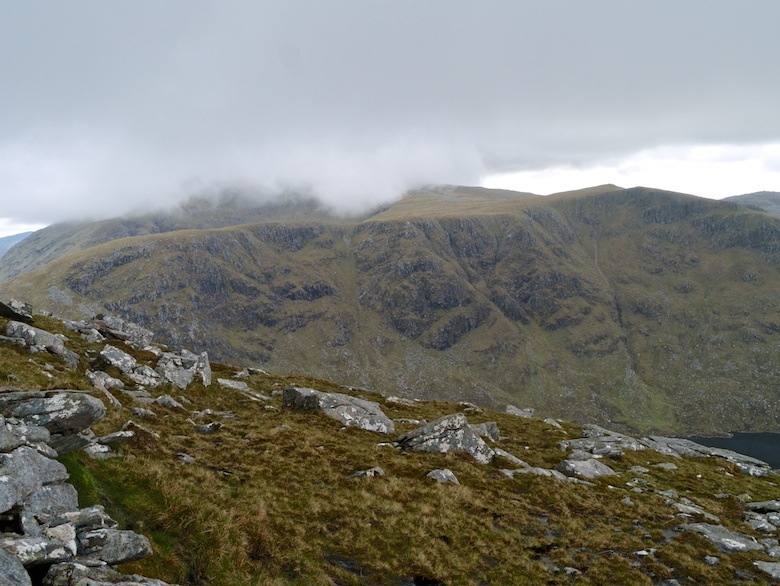 The cloud base remained below one hundred metres for the whole day. There was no point in trudging across rough moorland in the mist. There was however a spectacular moment when a golden eagle soared a few metres above the Bongo, a memorable sight. This on the other hand was tinged with sadness as I could make out several wind monitoring masts nearby, their tops lost in the clouds. I personally don’t understand the rationale of putting 150 metre turbines where there are so many eagles. 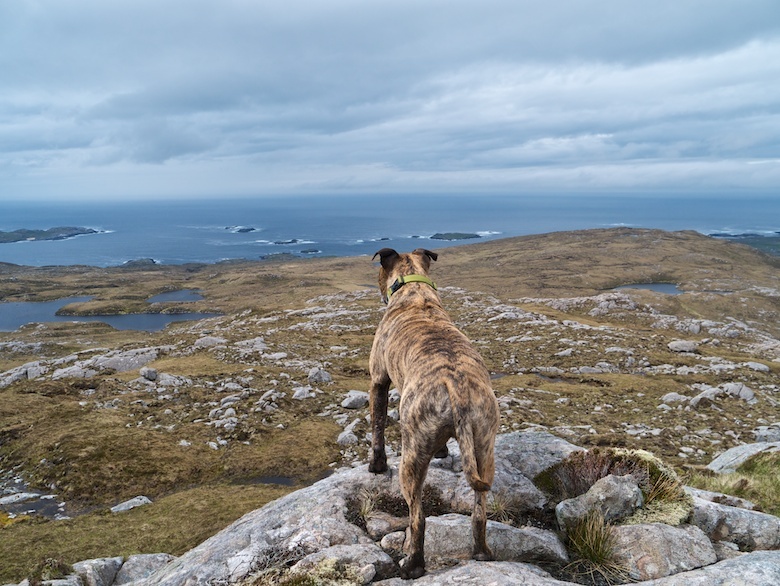 The night was spent a few miles away on the road high above Reinigeadal, with the hope of great views along the coast. Instead I was treated by low cloud, strong winds and heavy rain. It was a noisy night as the Bongo took on another Hebridean battering. 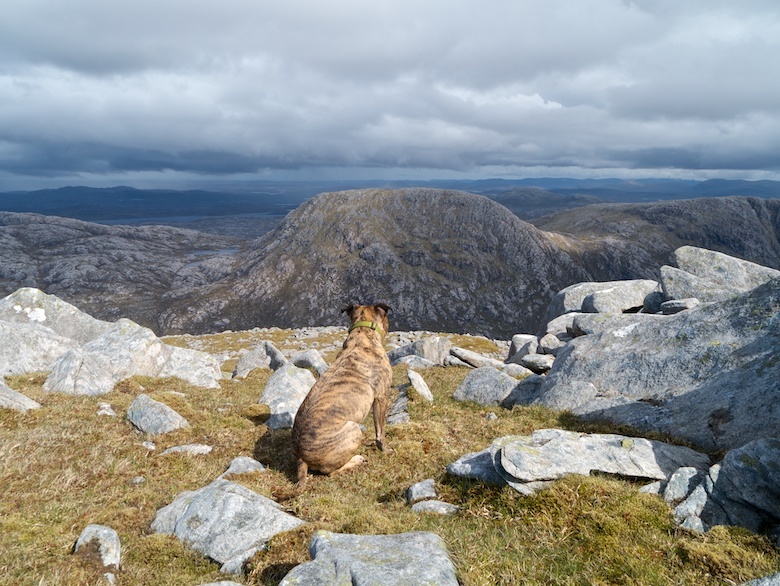 A couple of good friends just happened to be visiting the Outer Hebrides at the same time as myself and Reuben. 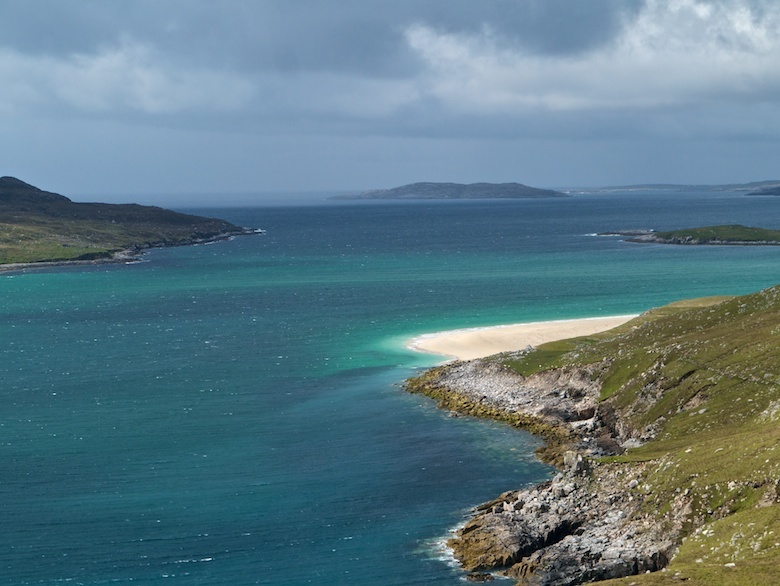 They had sailed to South Uist from Oban and were working their way up to Harris. We agreed to meet one evening at Huisinis and spend a couple of days together. 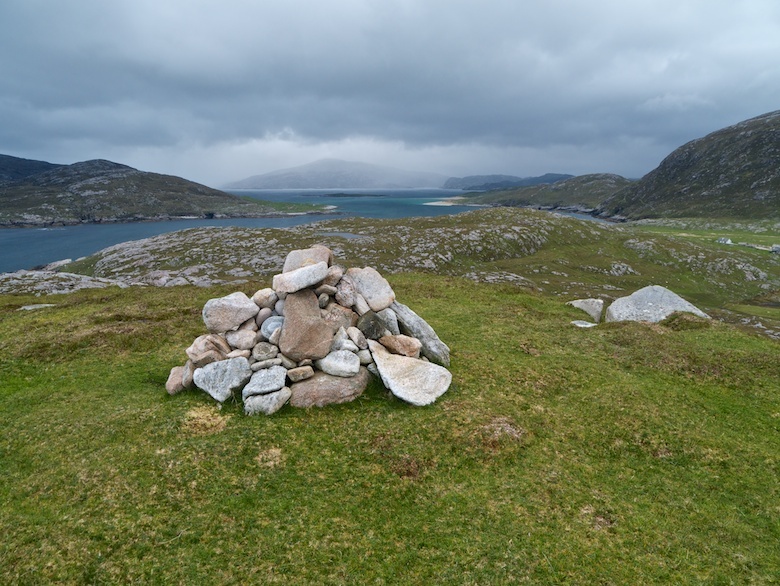 Huisinis is located at the end of a long single track road on the North Harris Estate. 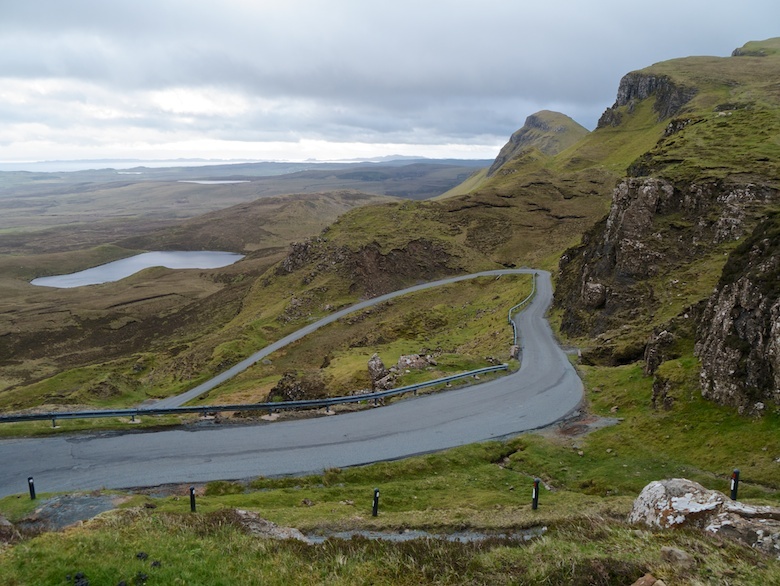 The scenery along the way is a perfect mixture of mountains and coast as the road snakes up and down the toes of the hills as they dip into the sea. I frequently pulled over the Bongo to sit and stare at the scenery, I did not actually get out of the van as the weather was truly dreadful. Reuben was dead set on enjoying the scenery from the comfort of the passenger seat. Declining to even contemplate going outside I did worry about the strength of his bladder as he had earlier refused a morning toilet trip. 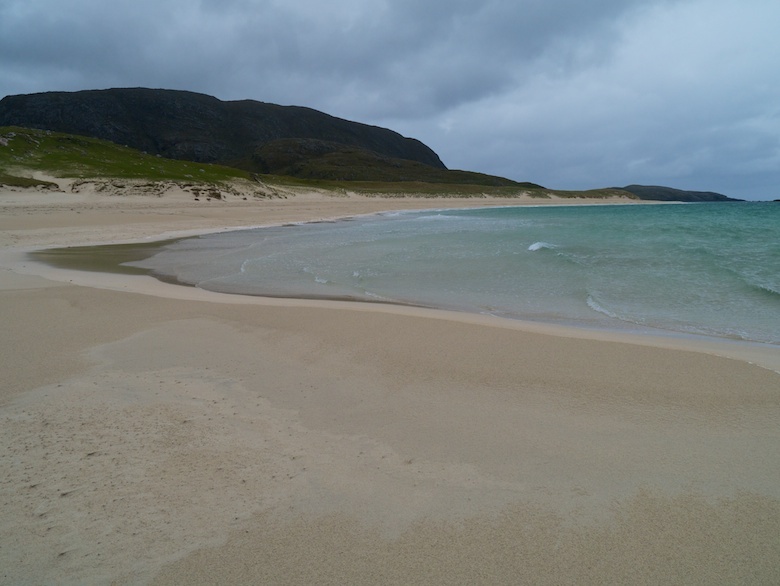 The beach at Huisinis is small but perfectly formed. A crescent of sand with water that would put many tropical paradises to shame. The car park however is also tiny and was filled with camper vans. 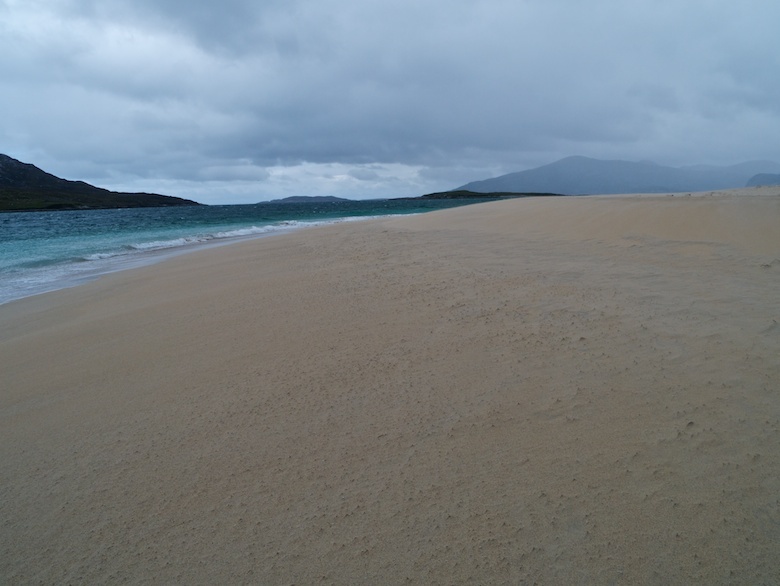 I noticed a sandy track leading to the north and the jetty that overlooks the Island of Scarp. It turned out to be a peaceful spot but also unsheltered from the very brisk and rather cold north wind that blew for the next couple of days. 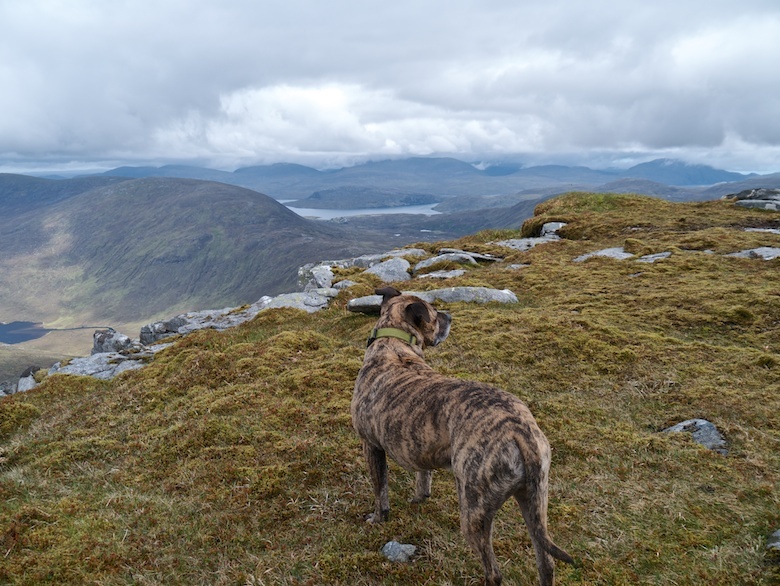 Thankfully that afternoon the rain finally stopped and we got to explore the headland and the small hill of Cnoc Mor. 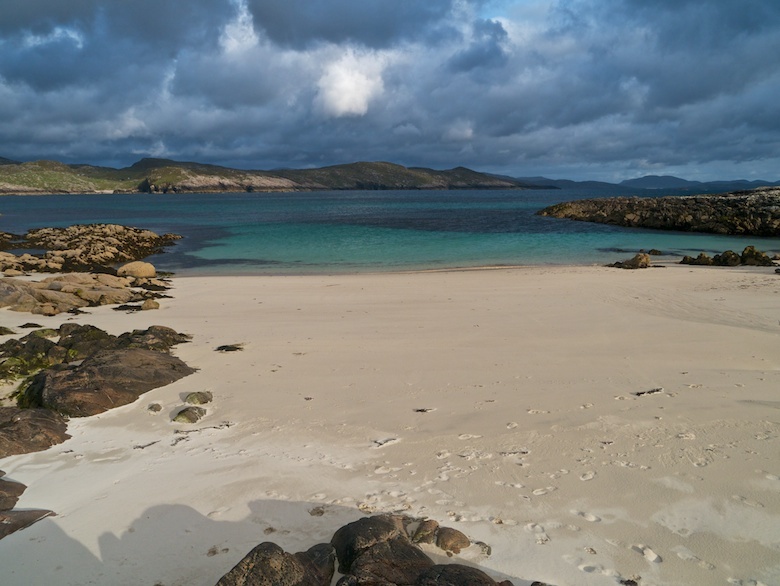 Graham and Rae appeared in the evening, pitching their tent above a small sandy bay just to the west of the main Huisinis beach. Attempts to be sociable were soon thwarted by the weather, showers once again rattling in on a cold wind. The plan the following day had been to walk north around the coast to Loch a Ghlinne and then take to the surrounding hills. 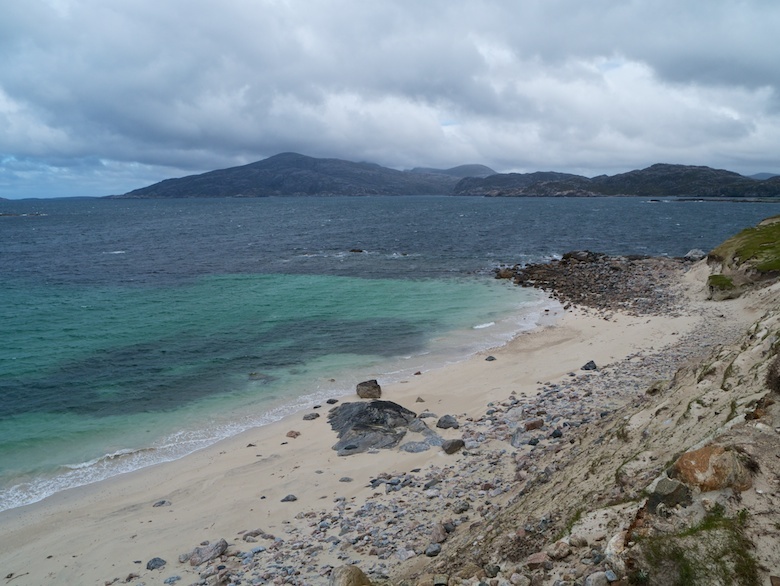 The strong wind made that a less than pleasant prospect, so we settled on a few hours slowly exploring the coastline. The surrounding area has some of the best beaches you are likely to find anywhere, even under cloudy skies the waters are a bright turquoise. 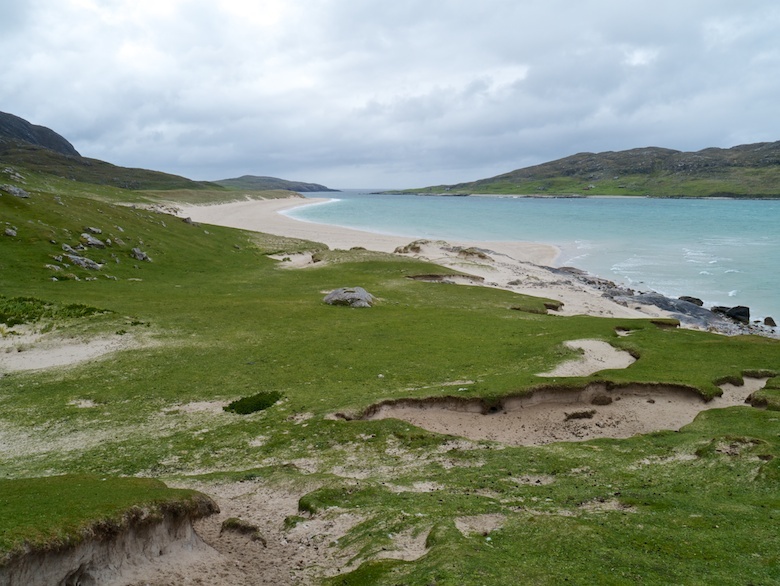 I’m going to have to return with a tent and spend a few days camping on some of that short-cropped machair right by the waters edge. 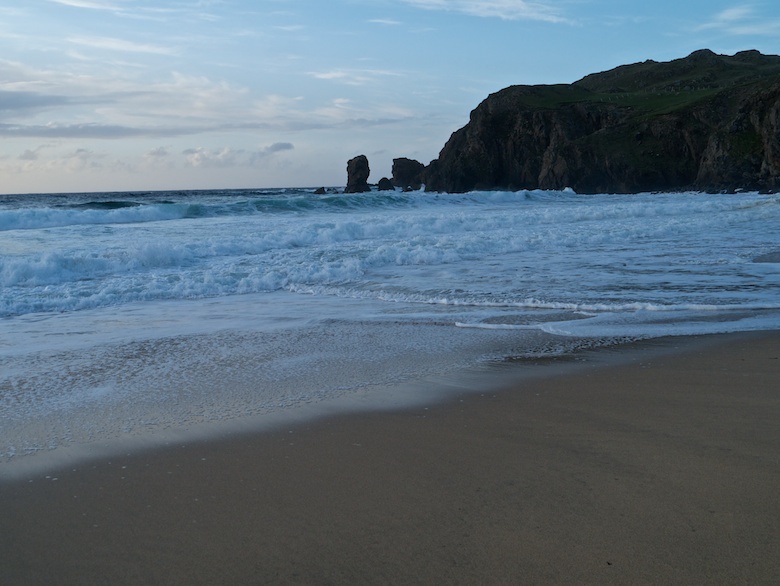 We did have a successful evening sitting at Graham and Rae’s ‘private’ beach. Even so the cold wind made it a down jacket affair even though it was the end of May. A good price to pay as it also kept the midges at bay. I find it hard to make decisions. Therefore with four brand new maps and a guidebook for Harris and Lewis in my possession I was overwhelmed with choice. With having never visited I was faced with a blank canvas of amazing looking places. The usual problem was that I wanted to see everything and climb all the mountains. An impossible task. In the end I went with no plans except to be at Huisinis on the Wednesday evening to meet friends. The weather would dictate my days, which it certainly did. 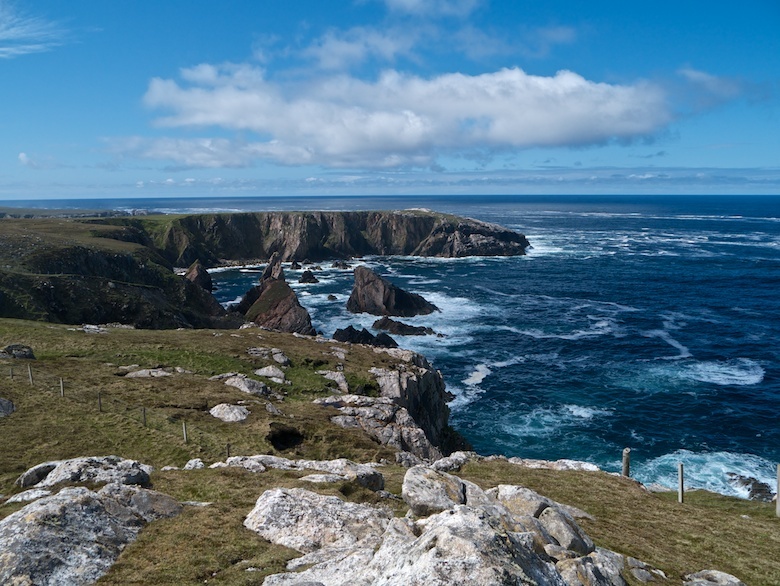 There is no way to avoid the fact that the Outer Hebrides are a long way from the East Midlands. This is especially the case in a campervan where travelling over 60mph equates to setting fire to a large pile of money. Setting off after work I got as far as the moors near the Tan Hill Inn before succumbing to tiredness. The following day was a blur of Highland scenery as mile after mile passed by. The highlight of the day being the Real Food Cafe in Tyndrum, purveyors of the best fish and chips in the country. 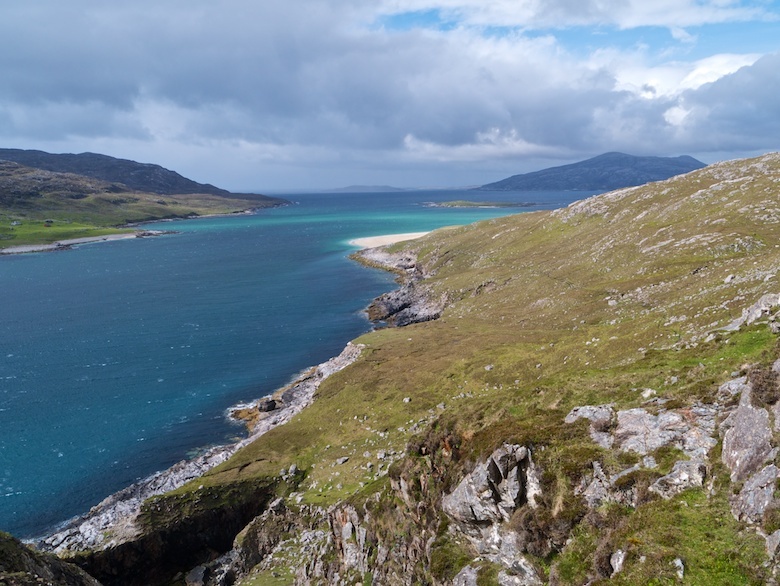 I had booked a ferry from Uig on the Isle of Skye to Tarbet on the Isle of Harris, the shortest possible crossing. Calmac charged me a very reasonable £70 return for myself and the Bongo. 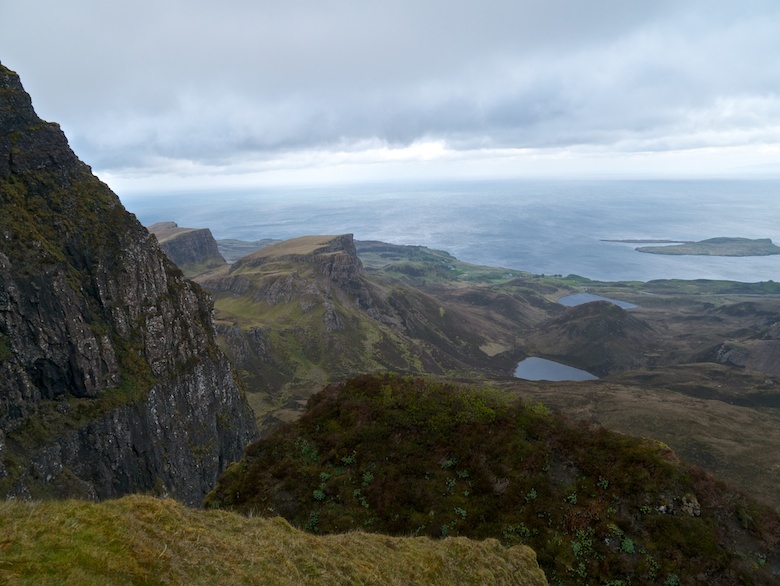 Sailing from the North of Skye would give the opportunity for a visit to the Quiraing, a place I have long wished to explore. 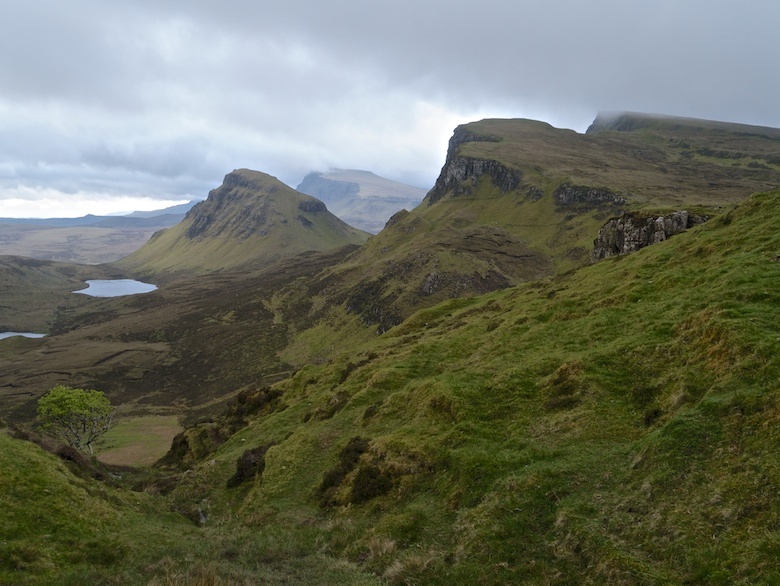 It was late as the Bongo climbed the steep zig zags up the single track road that crosses the Trotternish ridge. 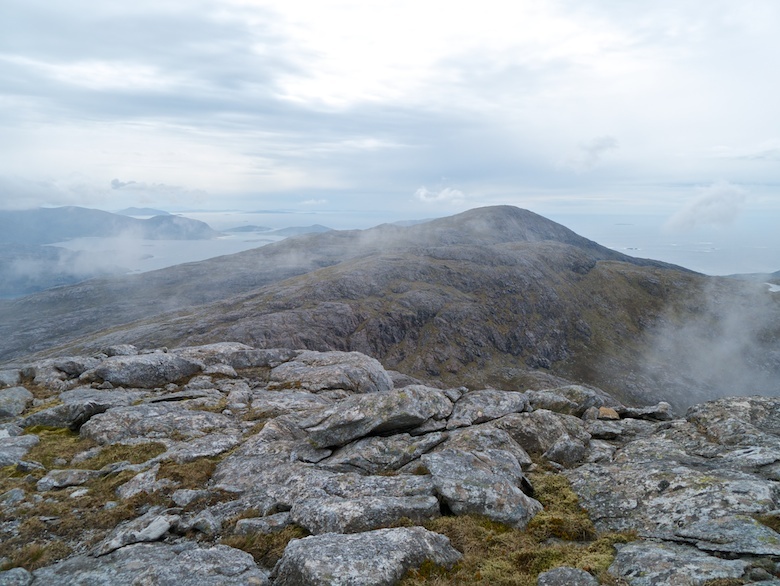 Low cloud clung to the higher slopes whilst a strong wind blew across the exposed bealach. It was strong enough to make opening the door a struggle. After an age behind the steering wheel it was with some relief that I bedded down for the night. The large parking area was deserted and I had a peaceful night. I was woken in the morning by a clunking and scratching noise from outside. Opening the door a flock of sheep scattered, they had been using the Bongo as a scratching post. The clunking had been many pairs of horns rubbing against the paintwork. 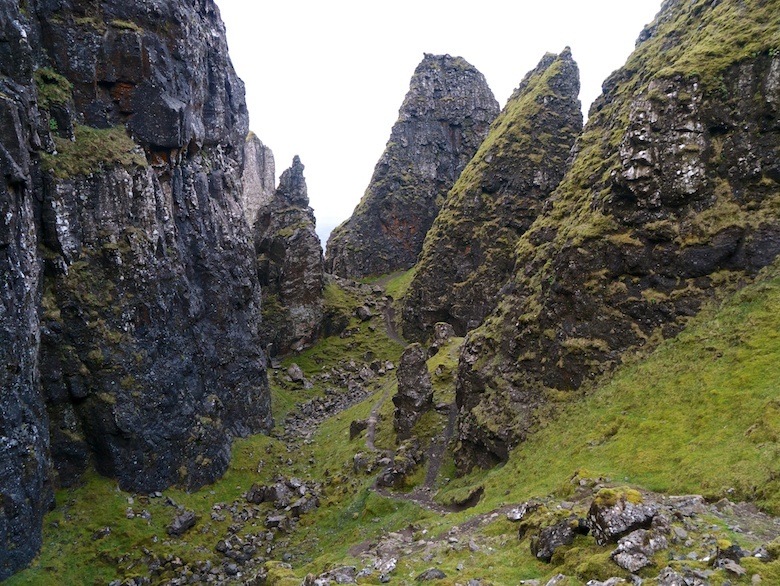 We were the first people of the day to set out along the high level path that leads to the Quiraing. 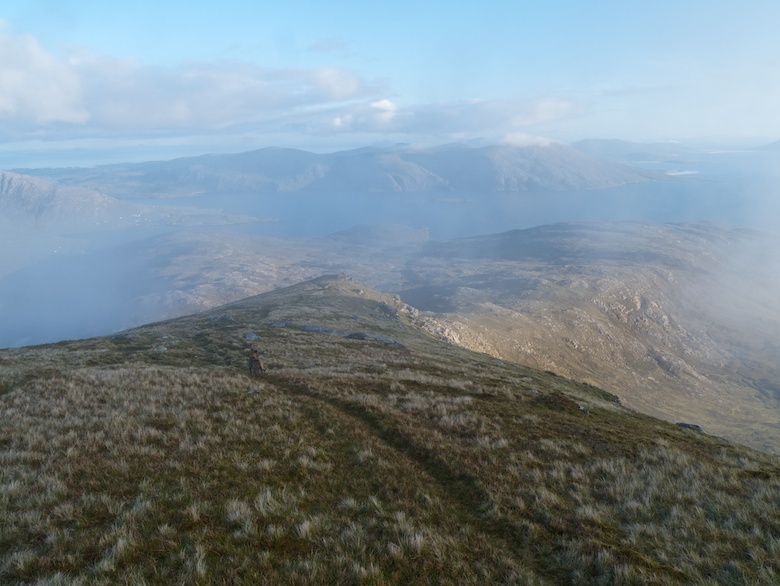 Apart from one easy scramble across a greasy gully the going is reasonably level along a good path. 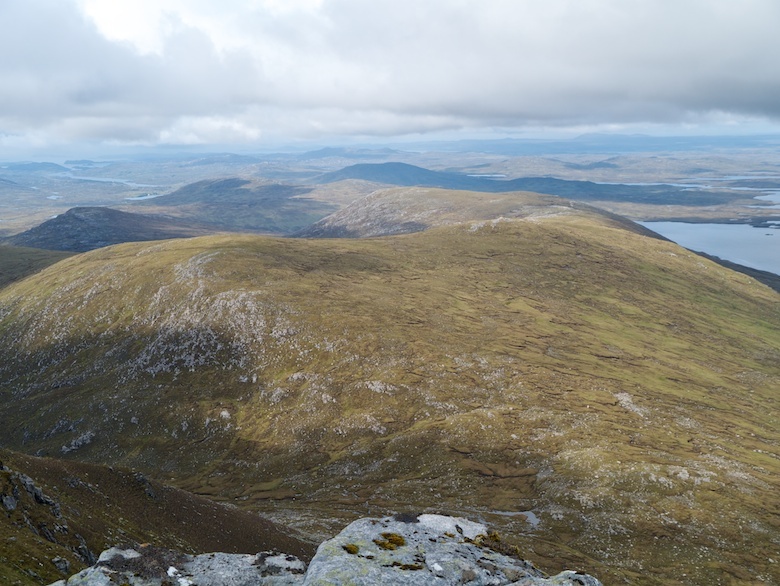 The wind caused difficulties on the steep loose climb up towards the pinnacle, gusts causing me to be unsteady on my feet. We were then in a magical hidden world, the like of which I have never seen before. 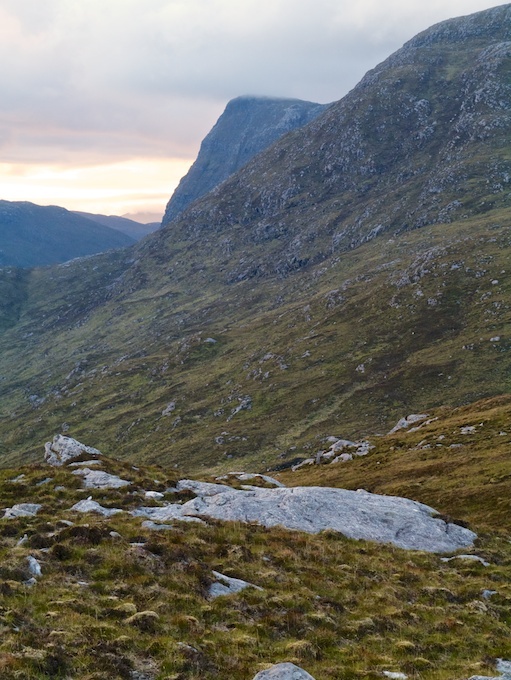 We only made it as far as the table, a spot which is crying out for a return to wild camp. Here the wind had disappeared, although the clouds were racing above like a time-lapse movie. Once down past the pinnacle again a combination of steep loose ground and the wind meant that I took a tumble. The only damage being a bruise to my leg and ego. 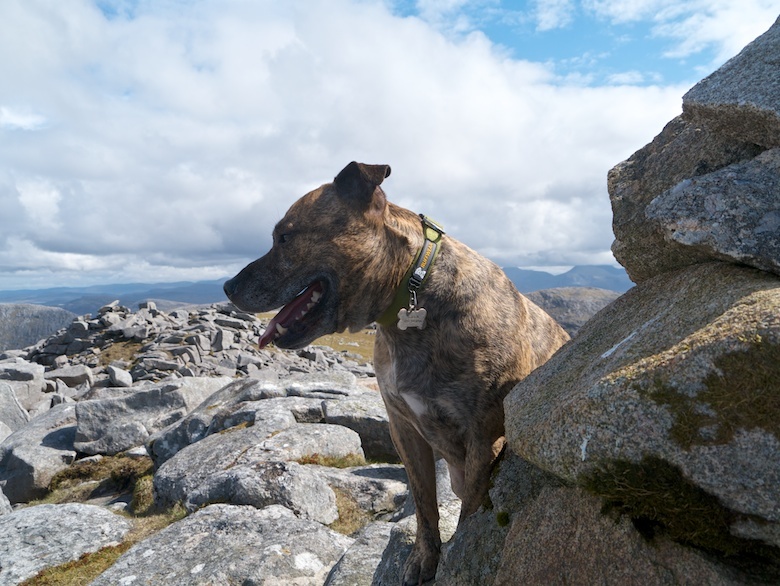 Even Reuben did a panicked little slide on the scree. As I returned back to the Bongo a steady stream of people had set out from the full car park. A deservedly popular spot. The ferry crossing was bumpy and with Reuben in tow I had to go without my usual Calmac fish and chips. We were confined to the doggy area as the wind and rain outside were none too inviting. Reuben ended up being a therapy dog to a Californian woman who has a fear of ferries. She and her husband were not very impressed with the weather and on a few occasions mentioned how hot and sunny it was back at home. 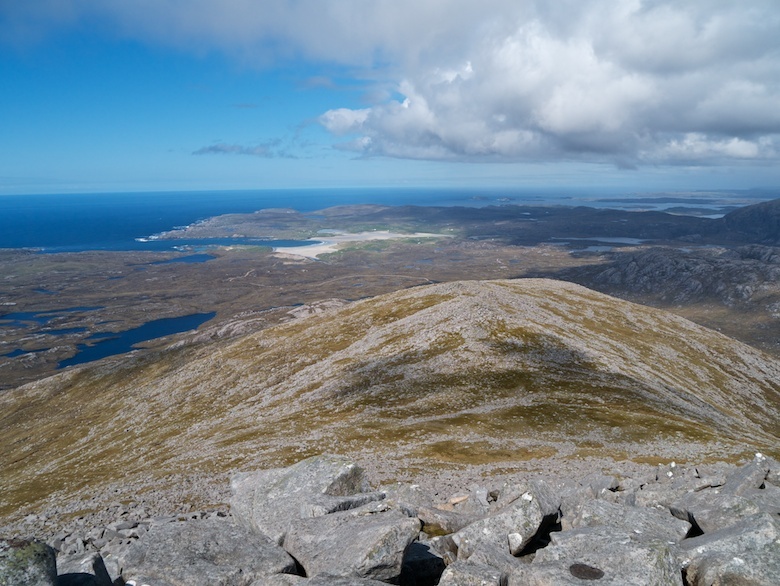 The sun was shining as we arrived on Harris. 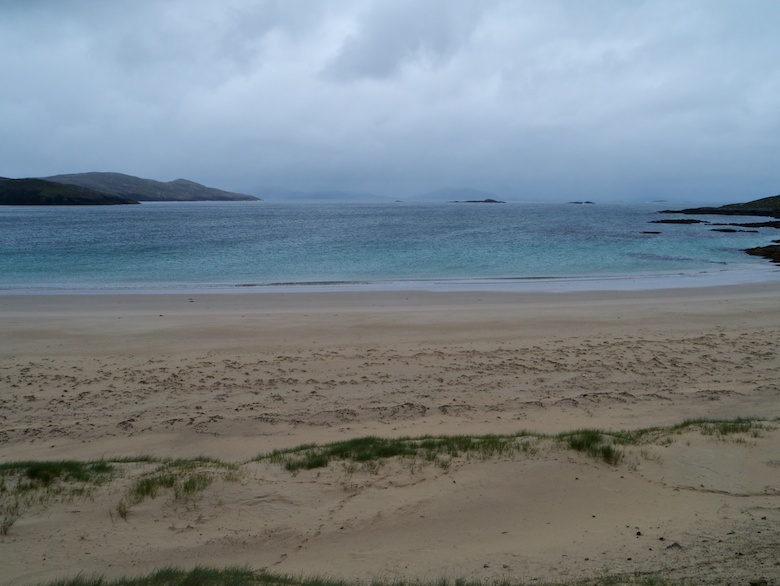 The daily rush hour on the island began as a queue of traffic snaked its way from the ferry towards Stornoway. I had a moment of confusion at the first road junction as the sign read Steòrnabhagh, the Scottish Gaelic version. 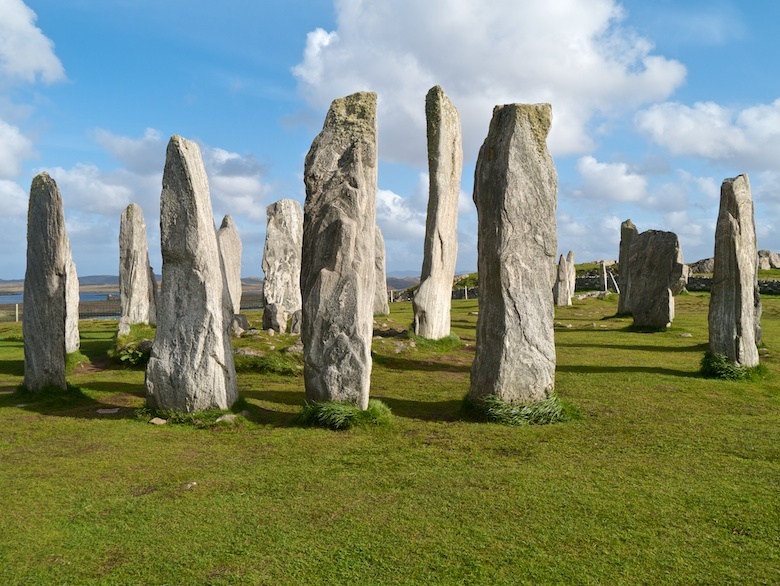 With good early evening weather and not enough time for a proper walk I headed towards the village of Calanais and its stone circle (Callanish is the English version). For such an important monument I was pleasantly surprised at just how low-key it was. A small visitor centre with a free car park and the stones surrounded by a bog standard wire fence. Entry was of course free. If it was in the Lake District I would have been relieved of half a weeks wages just to get a glimpse of them amongst the throngs. As it was I was the only person there as the sun was lowering towards the west. Although the obligatory hippy did pass by on his way to a nearby van. A great place to spend half an hour looking, sitting and admiring the patterns and textures of the stones. 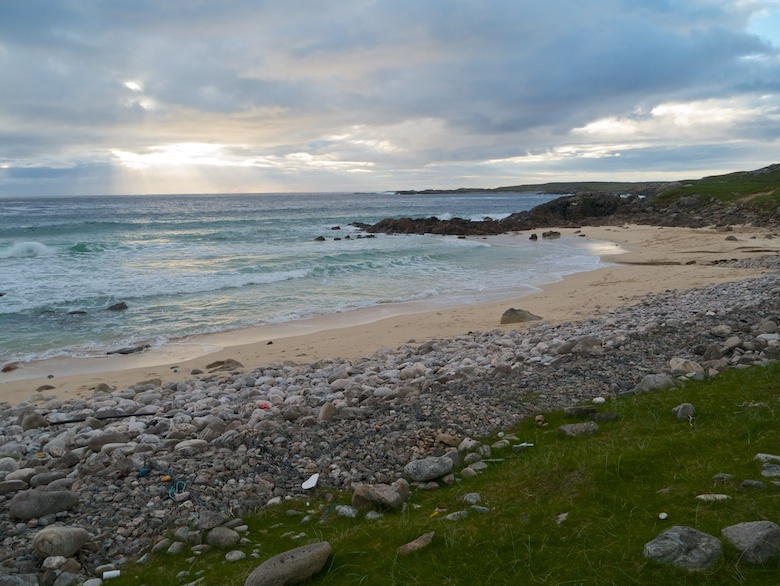 One of the pleasures of the Outer Hebrides is the relaxed attitudes toward campervans. However this is also a curse. 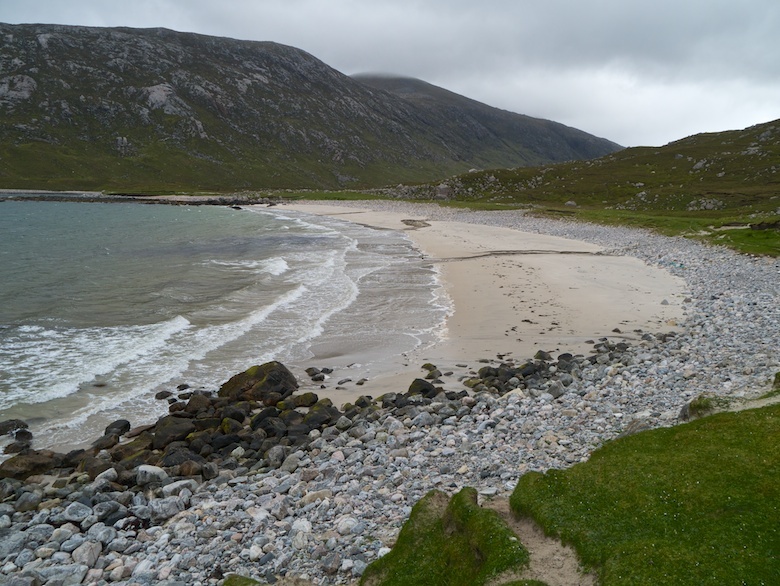 I had been tipped off that Bagh Dhail Mor would be a great place to park up for the night. It was. The problem was that a tour bus sized monstrosity was occupying all the parking spaces. It really was a revolting piece of machinery. I squeezed the petite Bongo into a grassy spot and silently fumed that the view was blighted by something with a name like Conan the Barbarian / Conquistador or whatever very large and expensive vans are called. Maybe I was just jealous. The beach however was superb and after the wind of the past couple of days the waves were impressive as they pounded the shore. Reuben was in his element, expanses of sand causing a malfunction in his head as he raced around as fast as he could. Sadly from the Bongo all I could see was the gold tour bus. Even more annoyingly the owners were friendly which made it difficult to hate them. 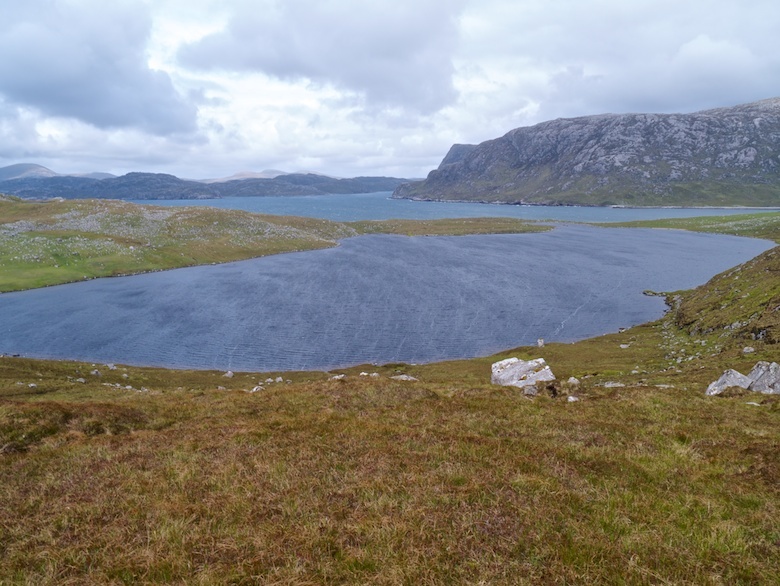 A map of north Lewis shows a lochan studded empty interior, the only habitation being along the coastal fringes. 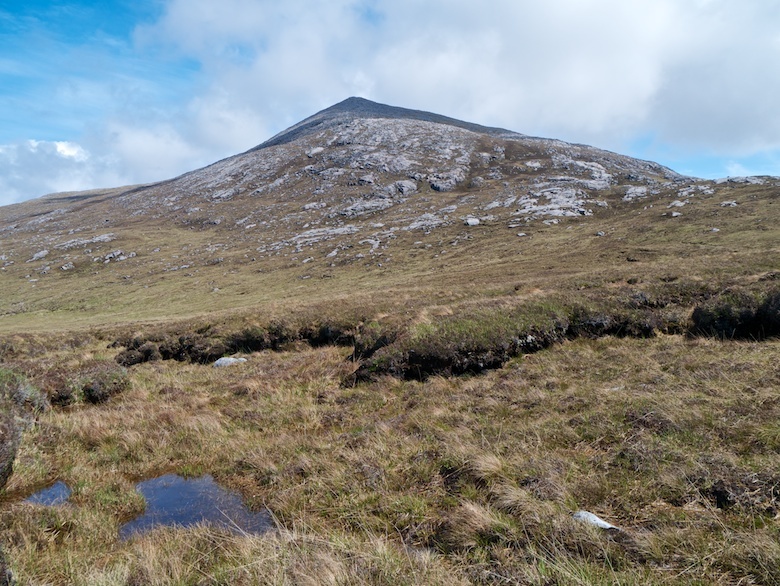 There are a few low-lying hills rising from the peaty wilds. 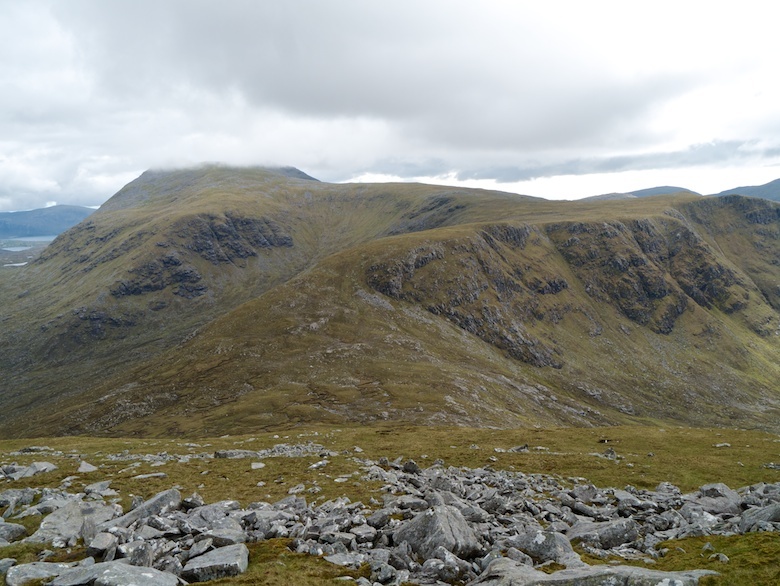 The rough and rugged Beinn Bhragair looked a perfect destination and viewpoint, climbed before the forecasted rain arrived at midday. Peat roads lead into the interior from the village of Siabost, which is strung out along the road. The one I picked was tarmaced and accessed from a bus turning circle. 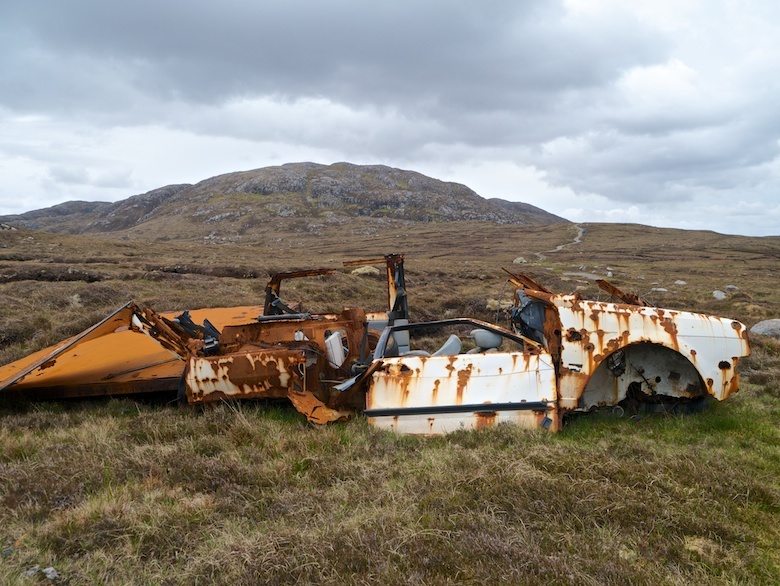 Its secondary function after giving access to the peat banks was as a graveyard for abandoned cars. The rusting heaps fitted in with the sombre surroundings and sombre weather. The track ended at an ugly and even more sombre concrete building which may have been some waterwork related infrastructure. A couple worked on a nearby peat bank, one cutting whilst another stacked the bricks. The climb to the summit was short and sweet. With the small hill rising head and shoulders above the surrounding moors the views were excellent despite the gloom. It was spectacularly bleak though, a spot perhaps best appreciated on a clear sunny day. 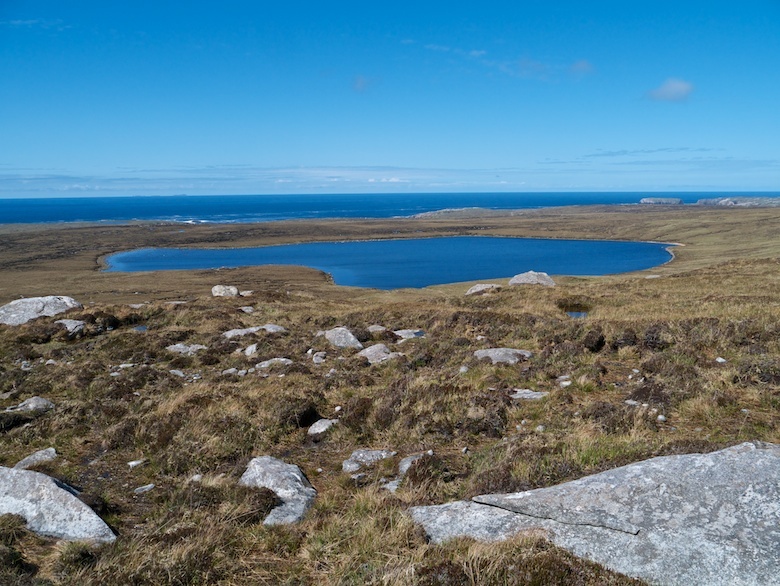 The Uig hills of South West Lewis are a worthy destination for anyone who appreciates wild, lonely and very rugged landscapes. I may even go as far as saying that they were the highlight of my trip. They are accessed from the end of a road that is possibly the longest cul-de sac in the UK. 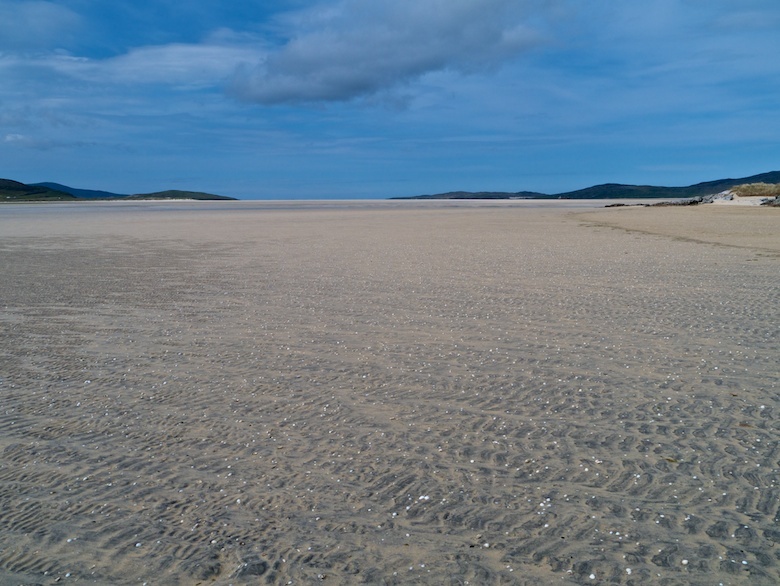 I stopped off overnight at the spectacular Traigh Uige, a gem of a beach. More on that in another post as I made a second visit. The weather in the morning was awful, hills hidden under thick cloud whilst curtains of rain swept across on a strong wind. A violent storm had swept through in the night, it sounded like the Bongo was being pebble dashed as I lay in bed. Thankfully no one was in a tent at the campsite as only the strongest mountain tent would have stood a chance in the wind. However by late morning the weather suddenly changed, within minutes grey had been replaced by blue, cold by warmth. We set off in the Bongo to the scattered community of Islibhig. 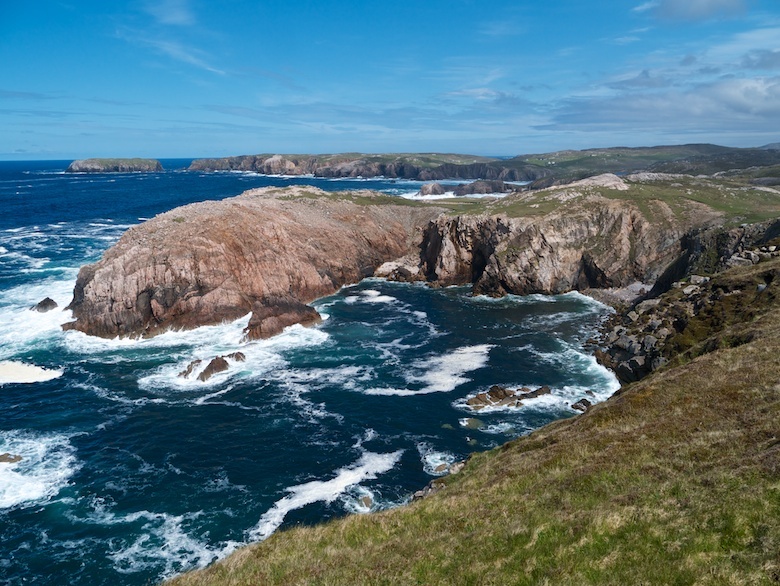 The coastal scenery on the way was spectacular, the deepest blue sea churning and crashing onto the cliffs. I frequently had to stop and stare, an area worthy of exploration on foot when I return (and I definitely will some day). 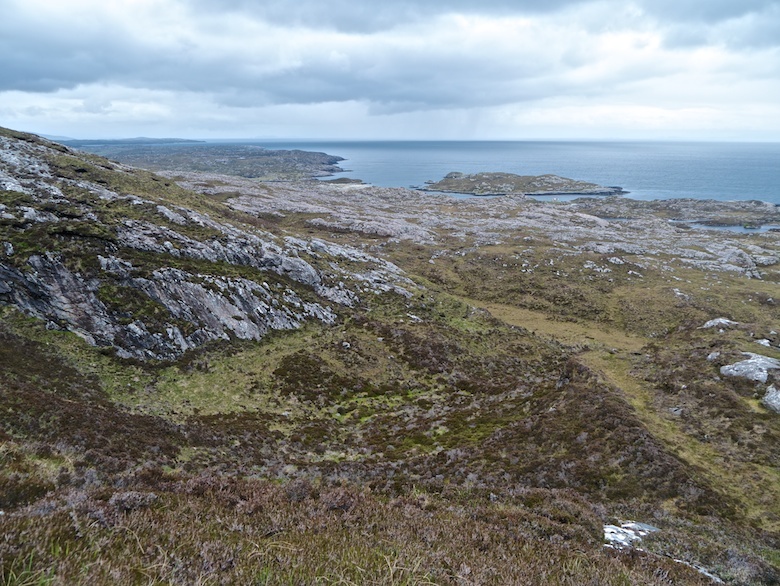 I left the bongo at the northern end of Islibhig by what I think are military ruins and took to another peat road. This one however was slowly being reclaimed by the moor. 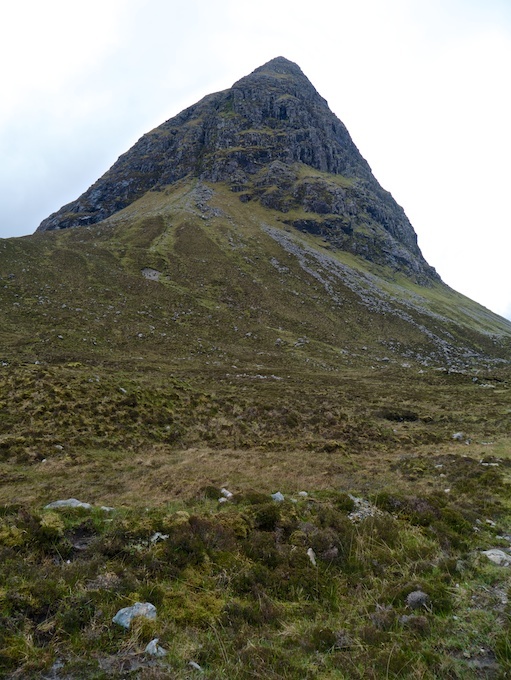 It soon disappeared leaving us on a boggy slosh towards Loch Sahnadabhat, Mealaisbhal rising in a rocky pyramid ahead. 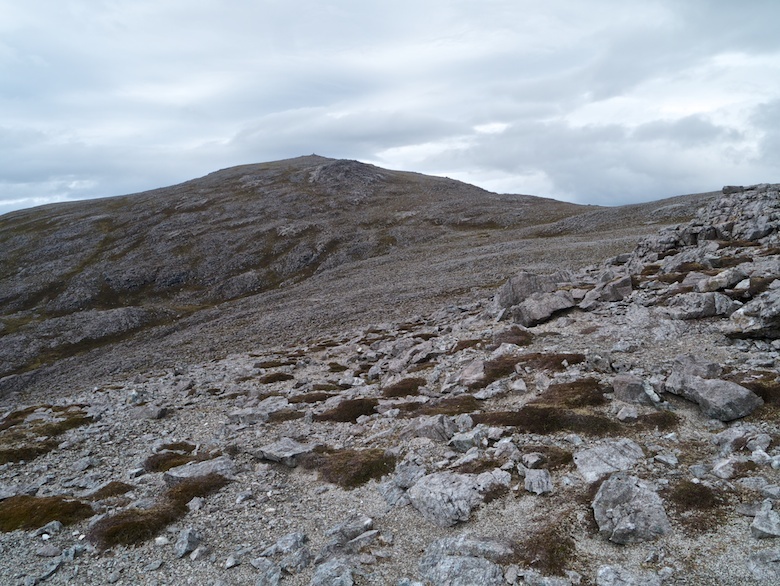 It was a surprisingly long climb to the summit, starting from sea level we had to earn every metre. 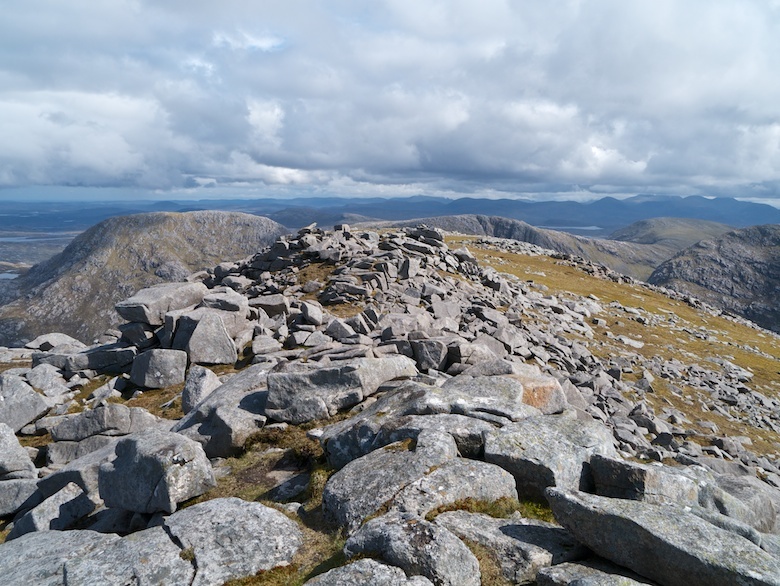 As height was gained the terrain became ever more rocky, the summit a jumble of boulders. 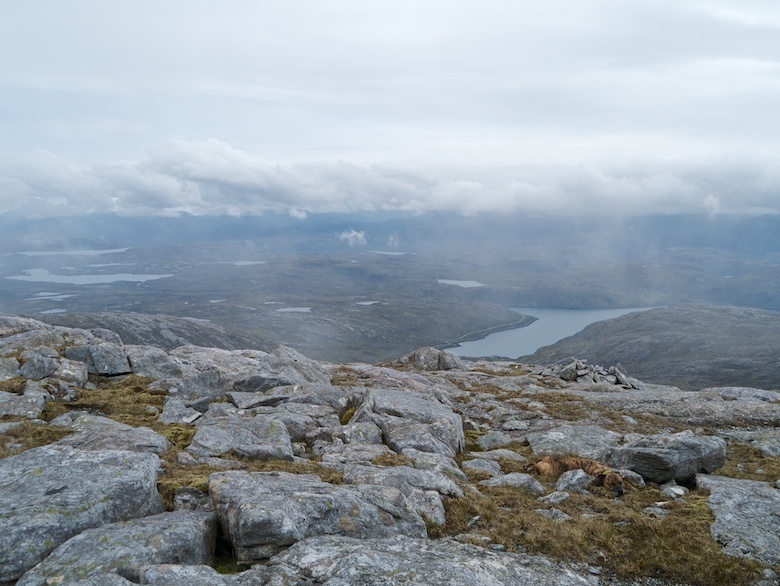 The views took my breath away, it was a perfect mix of mountain and coast, sunny skies and dark brooding clouds. 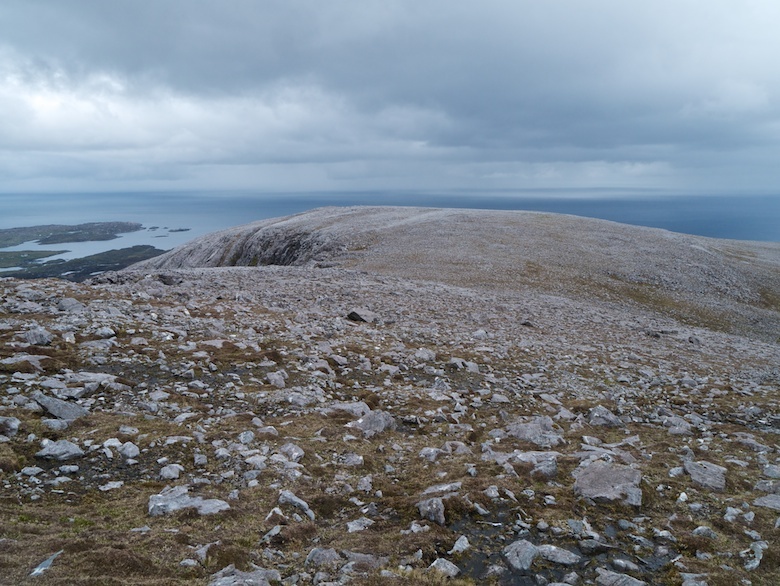 The surrounding Uig hills although they do not rise above 2000ft are more than a match for many much higher peaks. 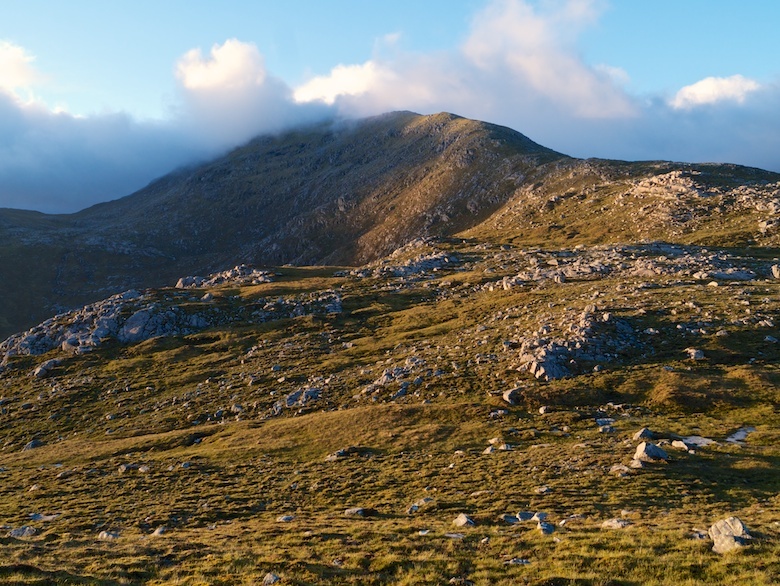 They reminded me a little of the Rhinogs in North Wales. 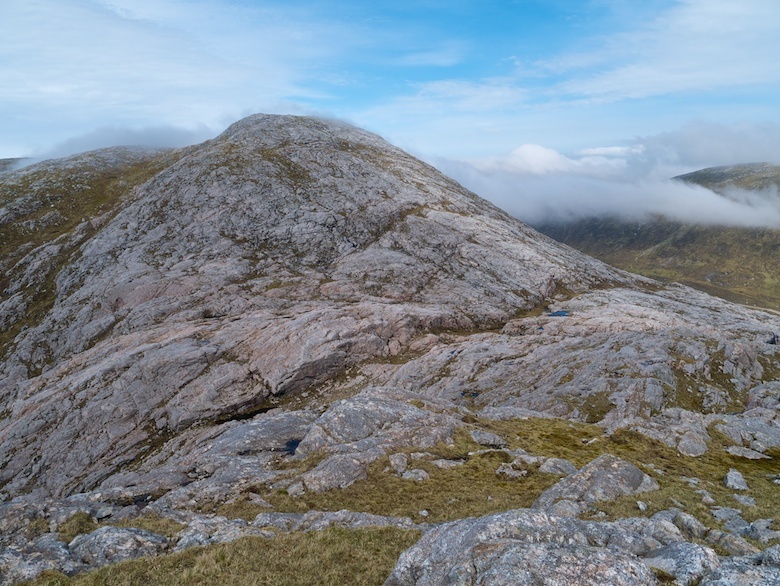 I had planned to climb the neighbouring peak of Cracabhal but down at the bealach the bands of cliffs looked intimidating and there are no traces of paths in these hills to show the way. 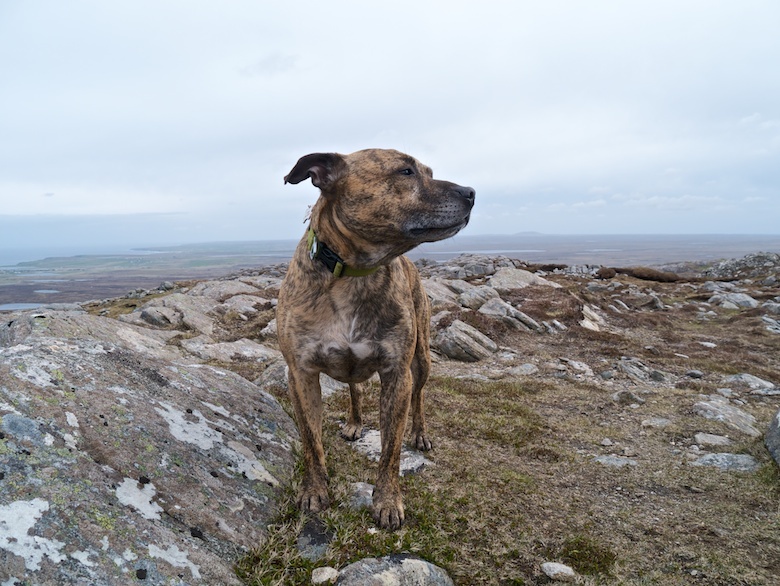 With Reuben in tow I decided not to head into the unknown and take risks. 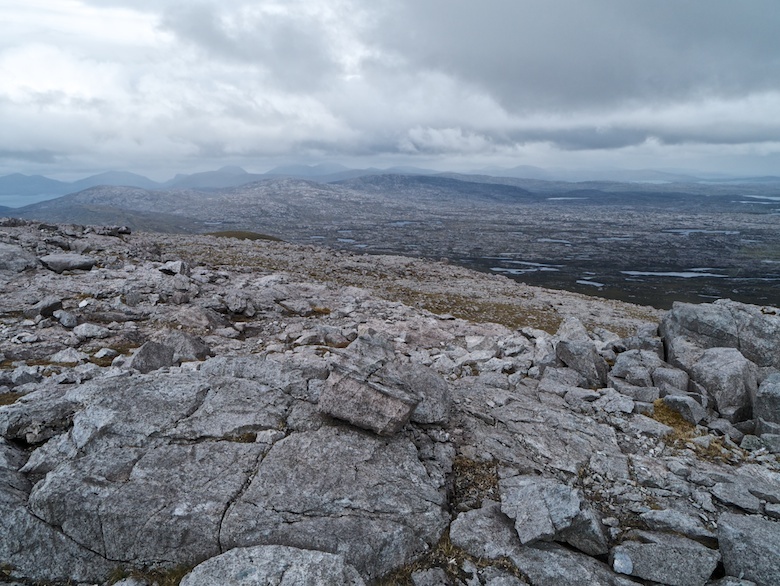 Instead we headed back down to the van through a tangle of rock, bog and vegetation. An afternoon short on miles but full of jaw dropping scenery. 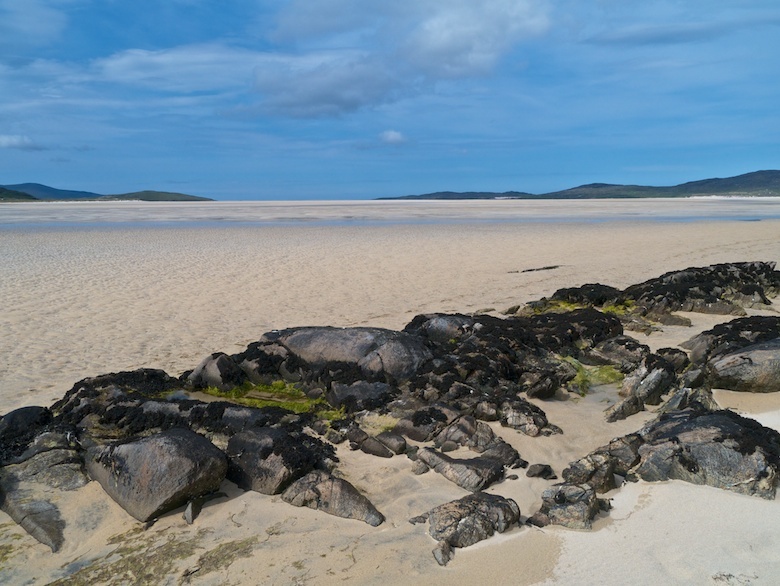 A mile before the end of the single track road on South West Lewis is the small but perfectly formed Mealasta beach. 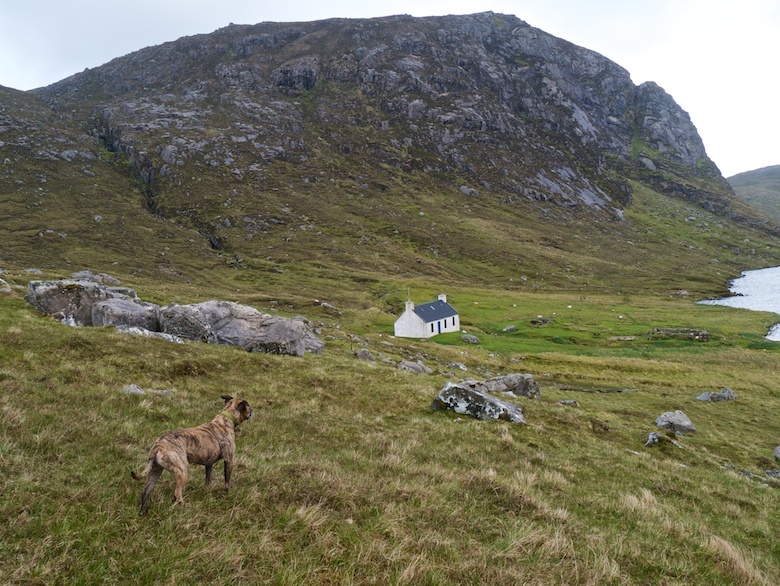 I called it home for a couple of nights, an ideal location for another assault on the Uig hills the following day. It ended up being a fairly busy spot on the first night with a couple of bikers and a cyclist pitching their tents nearby. Later in the evening a German couple knocked on my door to ask if they could park their van next to mine. 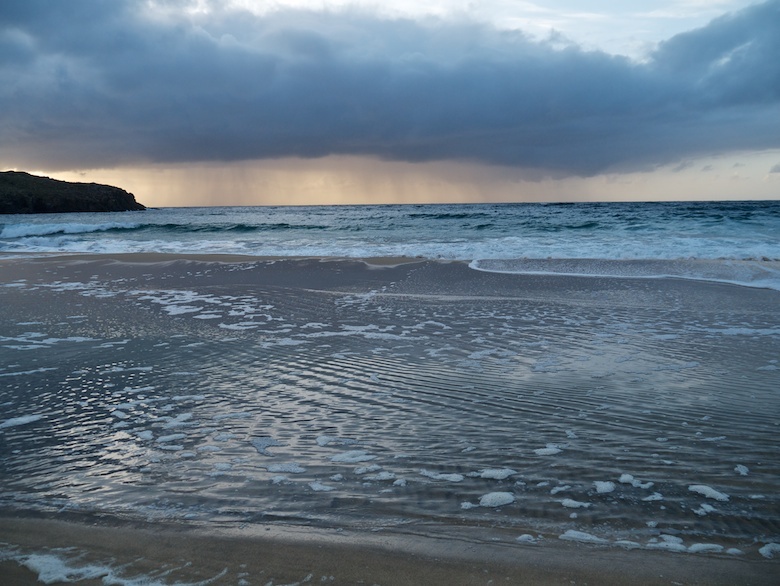 Darkness comes late to the Hebrides at the end of May and I was hopeful for a sunset. This did not arrive but there was a decent light display piercing the brooding clouds. 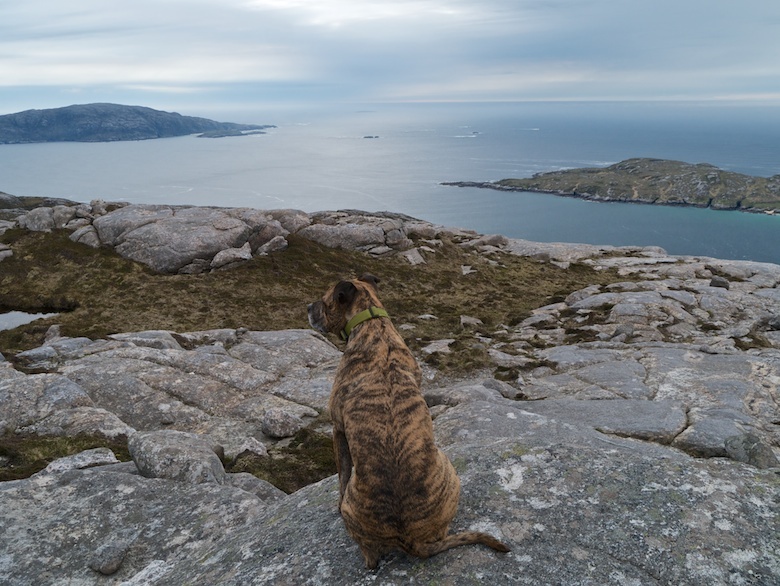 I packed my rucksack before going to bed, ready for a longer and tougher walk the following day. I was looking forward to having a full day in the hills.